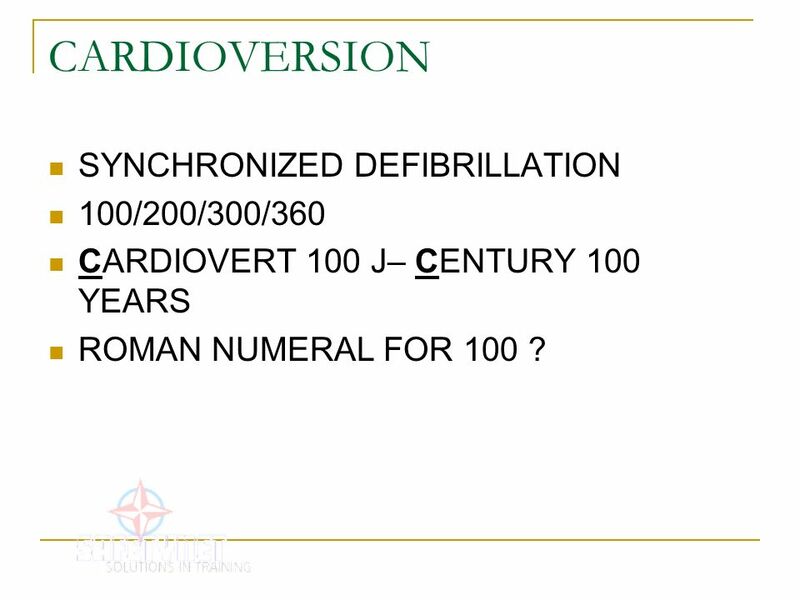 CARDIOVERT 100 J– CENTURY 100 YEARS ROMAN NUMERAL FOR 100 ? 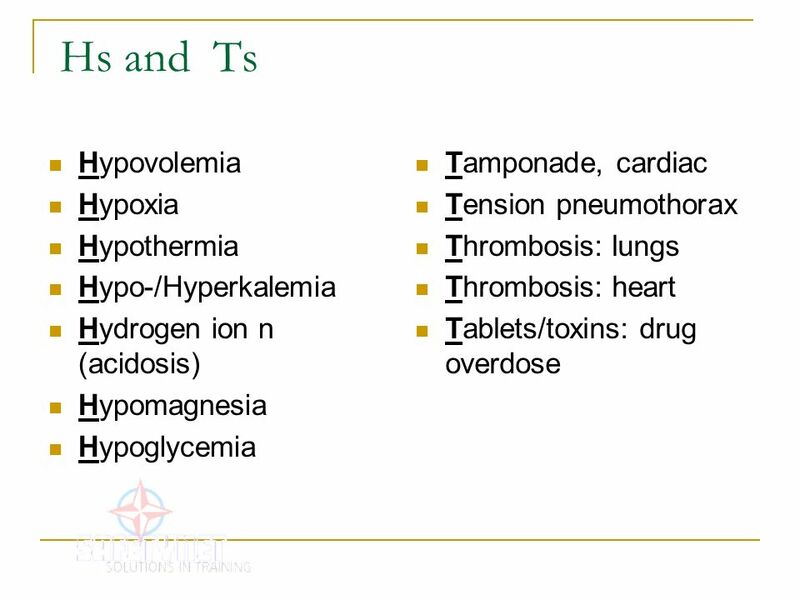 Hydrogen ion n (acidosis) Hypomagnesia Hypoglycemia Tamponade, cardiac Tension pneumothorax Thrombosis: lungs Thrombosis: heart Tablets/toxins: drug overdose The 5 Hs and 5 Ts is another memory aid that may be used to recall possible treatable causes of cardiac emergencies. 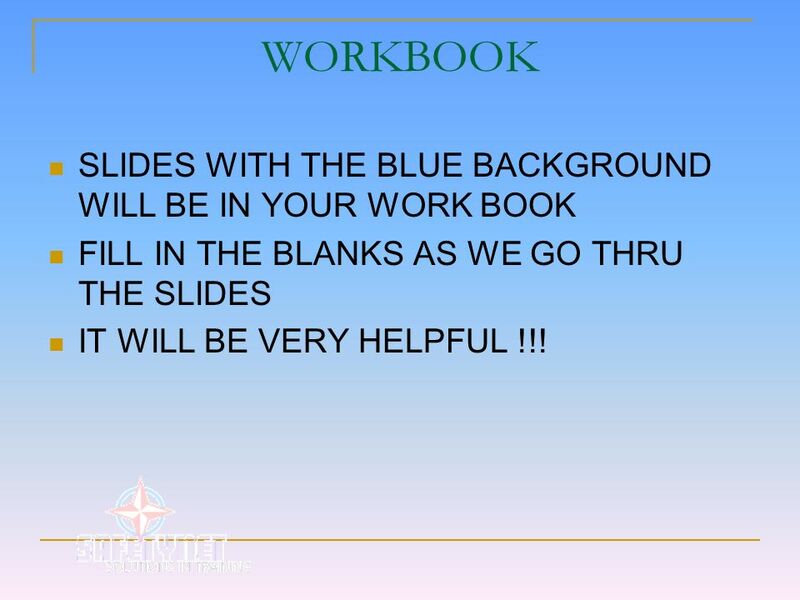 FILL IN THE BLANKS AS WE GO THRU THE SLIDES IT WILL BE VERY HELPFUL !!! 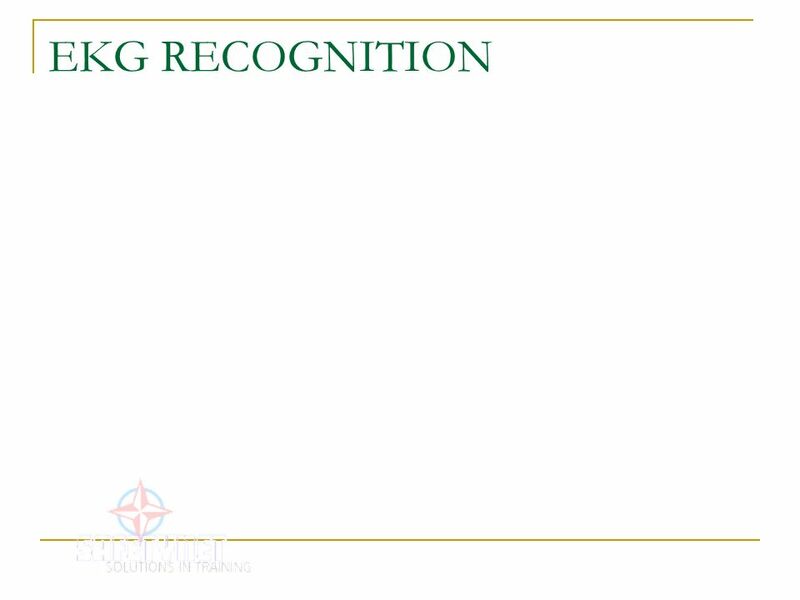 Recognition of signs of: Stroke Heart Attack Cardiac arrest FBAO How to perform: Abdominal thrust CPR Early Defibrillation with an AED Until recently, resuscitation guidelines for an infant referred to a child less than 1 year of age. A child was considered 1 to 8 years of age and adult resuscitation guidelines applied to individuals more than 8 years of age. 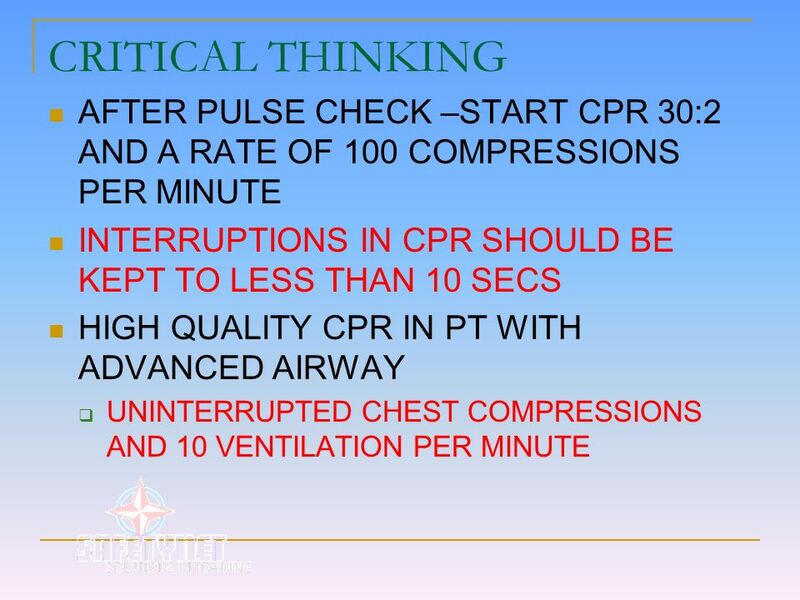 The 2005 resuscitation guidelines redefined the age of a child for healthcare professionals. 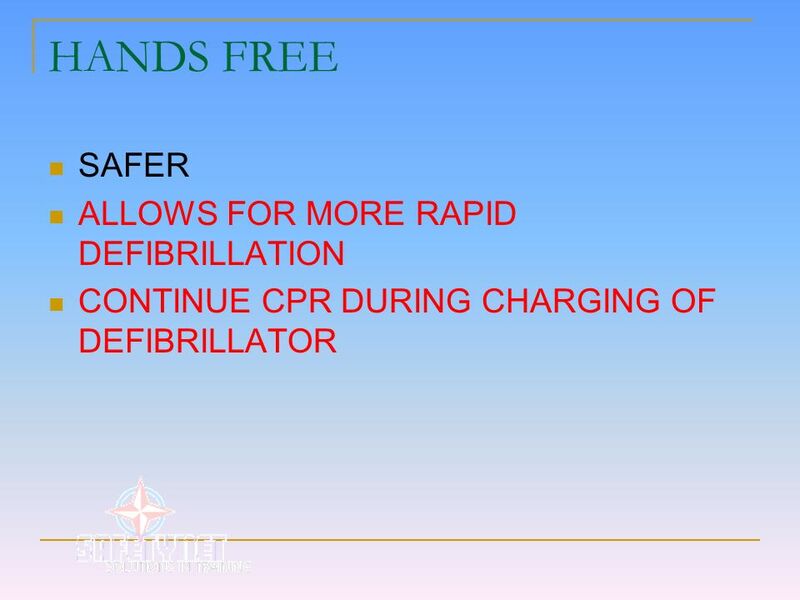 Child resuscitation guidelines apply to victims from 1 year of age to the onset of puberty (about 12 to 14 years of age). 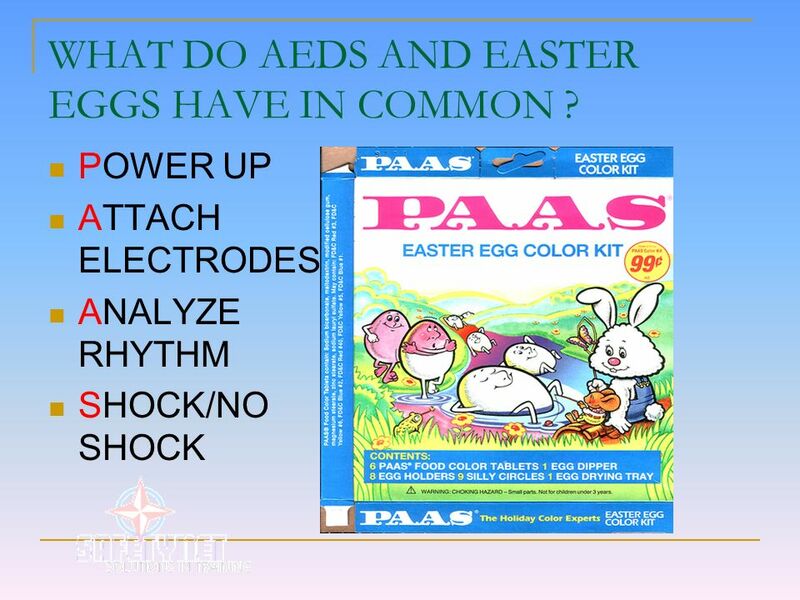 27 WHAT DO AEDS AND EASTER EGGS HAVE IN COMMON ? 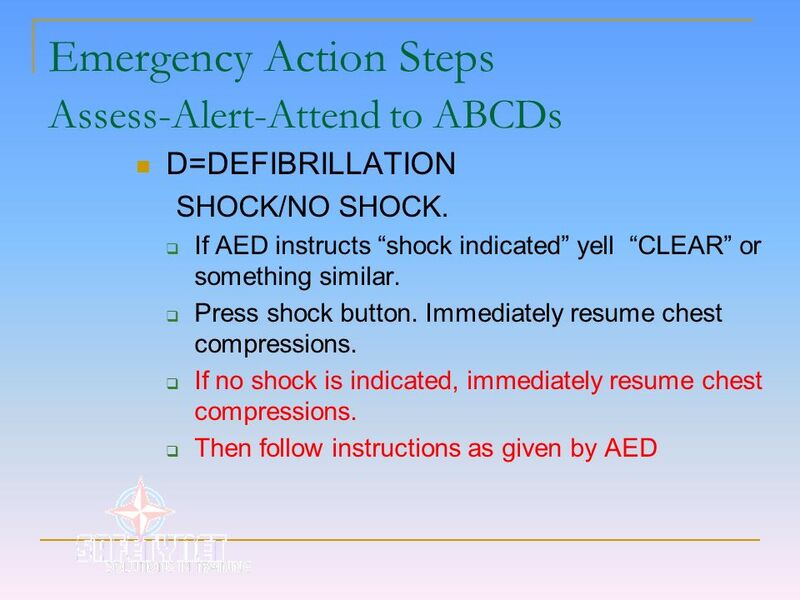 D=DEFIBRILLATION (Summary) SHOCK advised CLEAR and give 1 shock. Immediately resume CPR. Continue 30:2 x 5 cycles (2 min.). Reassess rhythm. 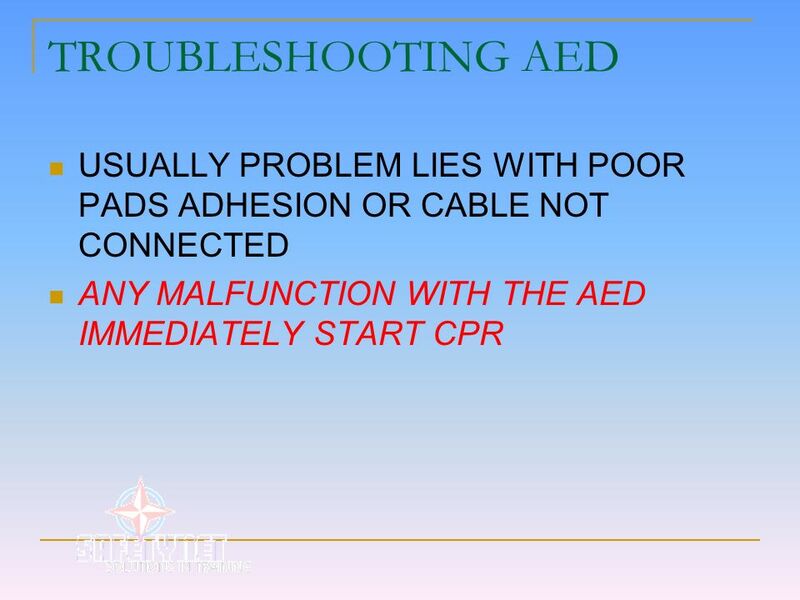 NO SHOCK advised Immediately resume CPR AEDS that have not been reprogrammed to 2005 recommendations may repeat charging sequence for a second and third shock. 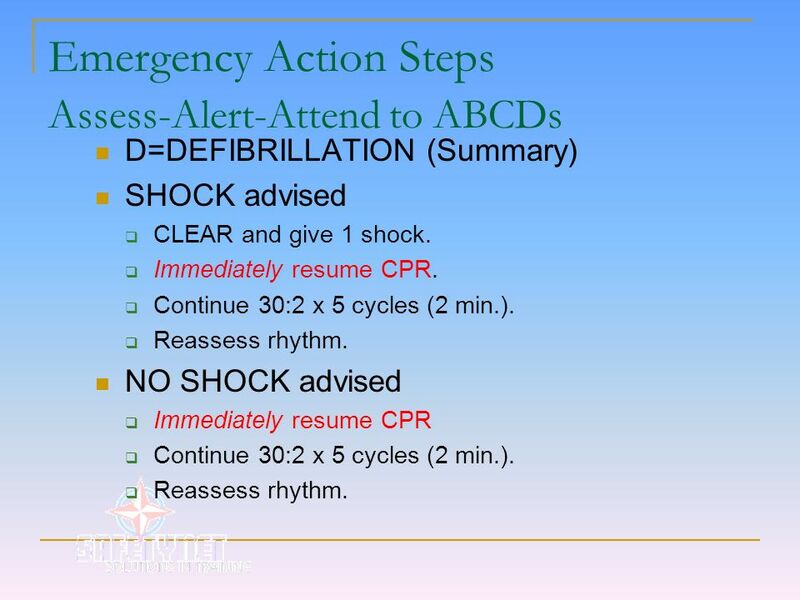 During series of 3 shocks, rescuer should not interrupt or interfere. These AEDS are programmed to allow 1 minute (as opposed to 2 minutes) for CPR between shocks. 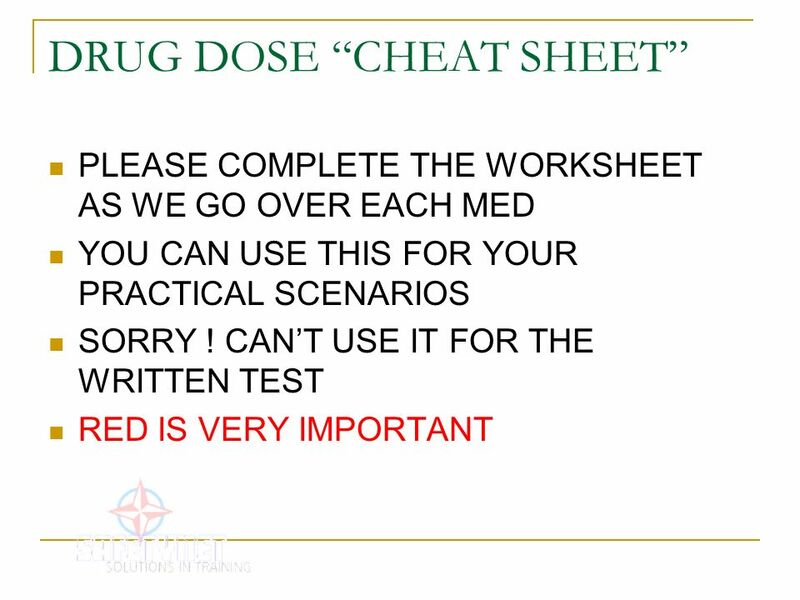 In all cases, listen to and follow AEDS voice/visual prompts. 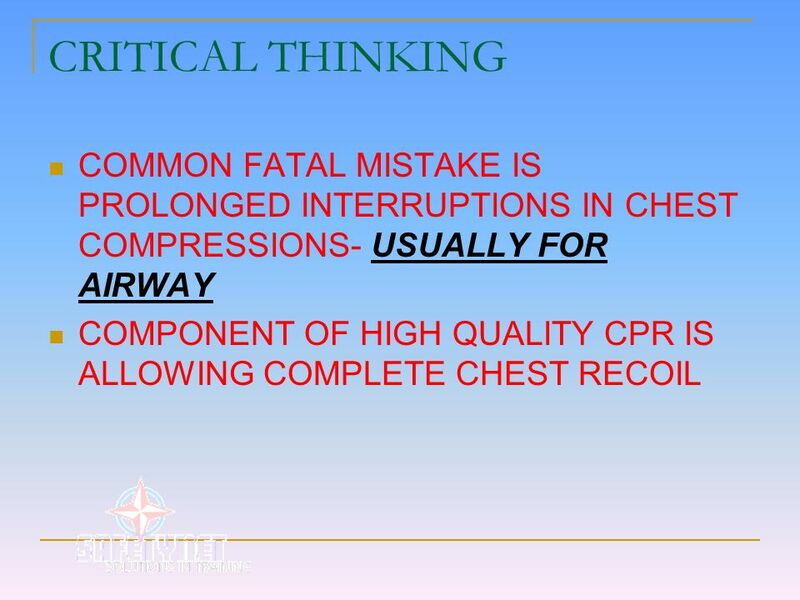 Do your best to minimize interruptions in chest compressions. 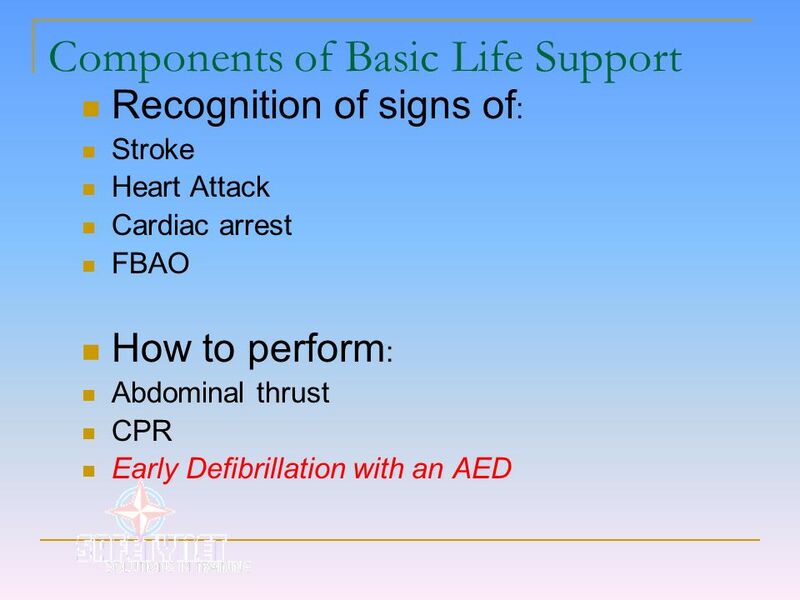 For an unwitnessed cardiac arrest, local protocol may instruct EMS providers to provide a couple minutes of CPR to oxygenate heart and brain before attempting defibrillation. 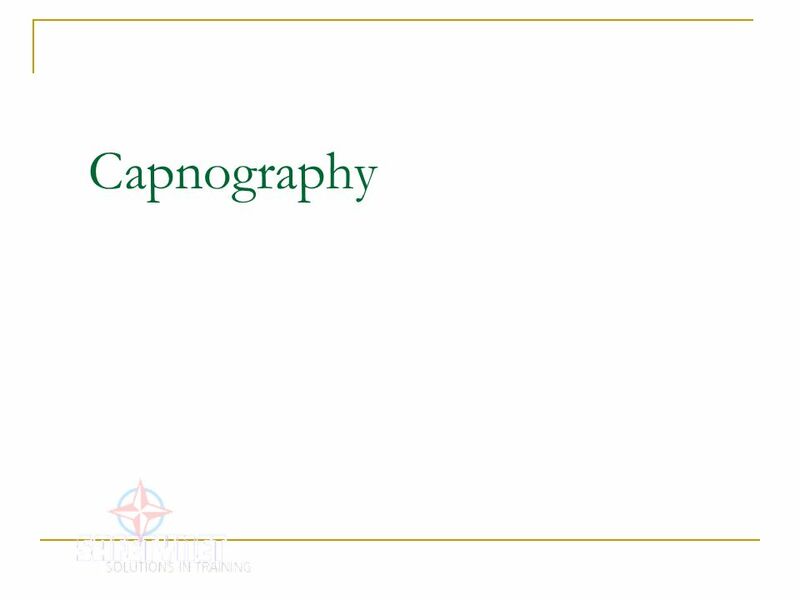 Capnography is the continuous analysis and recording of carbon dioxide concentrations in respiratory gases. 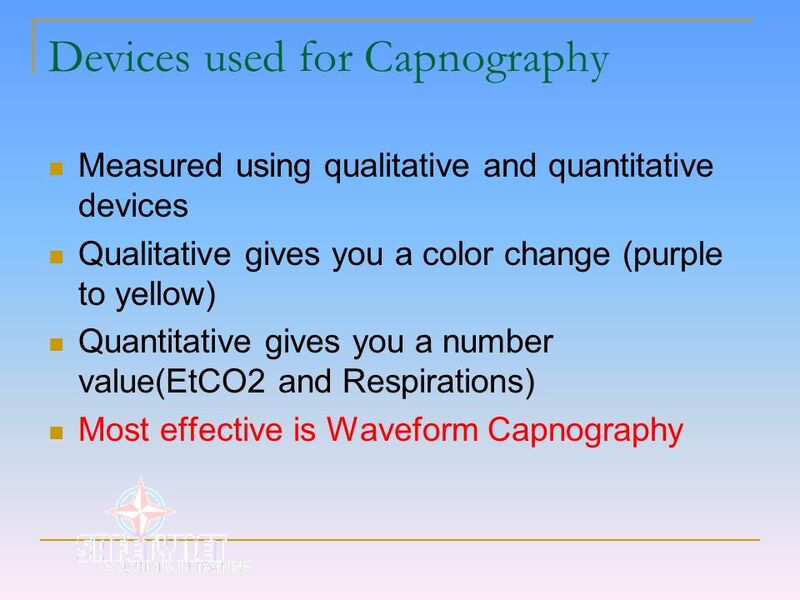 Capnometry is the measurement of CO2 concentrations without a continuous written record or waveform. A capnometer is a device used to measure the concentration of CO2 at the end of exhalation. 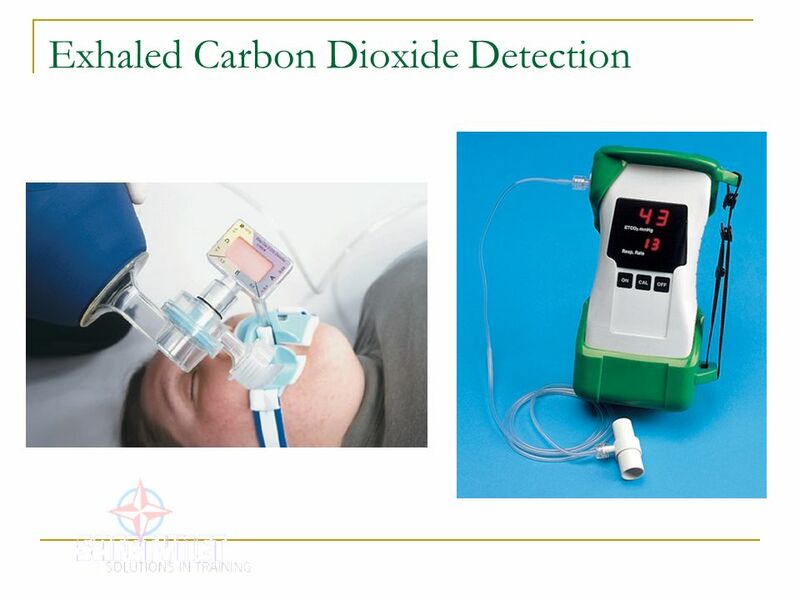 An end-tidal CO2 (ETCO2) detector is a capnometer that provides a noninvasive estimate of alveolar ventilation, the concentration of exhaled CO2 from the lungs, and arterial carbon dioxide content. 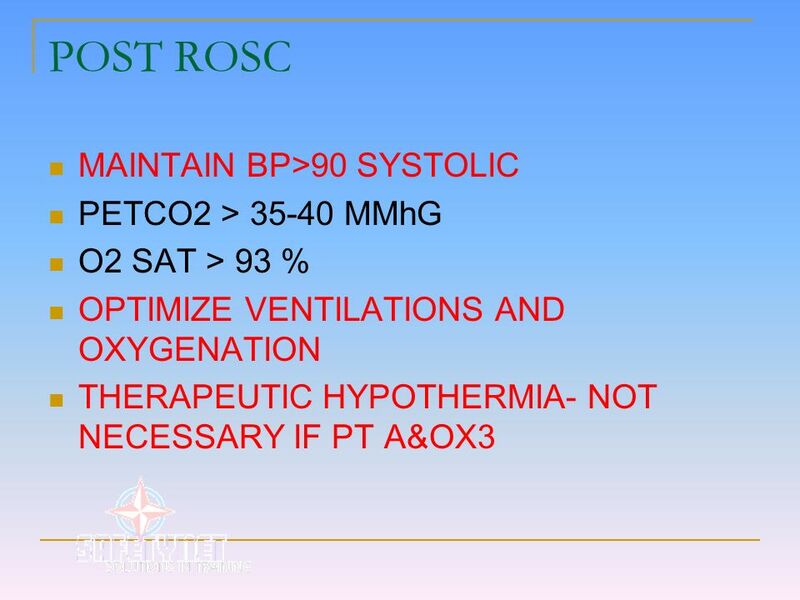 ETCO2 monitoring is currently used for assessment of conscious sedation safety, evaluation of mechanical ventilation, verification of endotracheal tube placement, continuous monitoring of endotracheal tube position, and monitoring of exhaled CO2 levels in patients with suspected increased intracranial pressure. 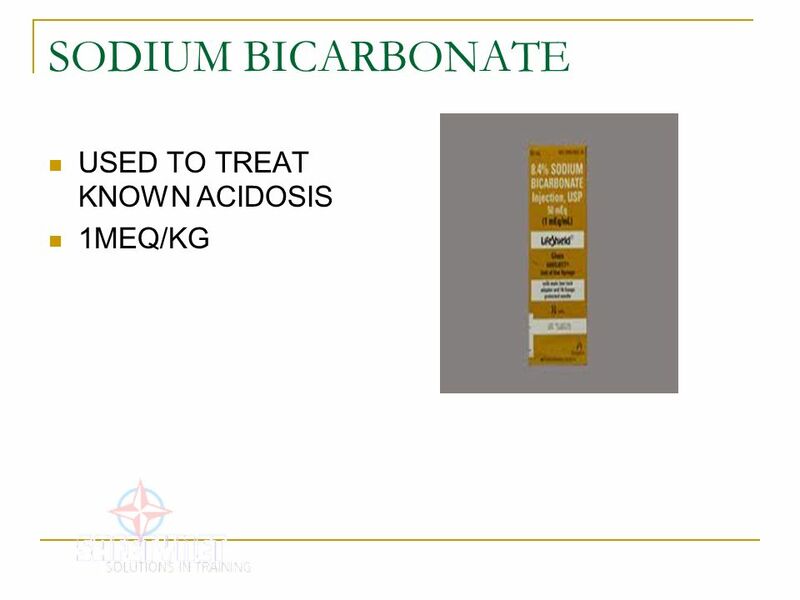 Because the air in the esophagus normally has very low levels of CO2, capnometry is considered a rapid method of preventing unrecognized esophageal intubation. 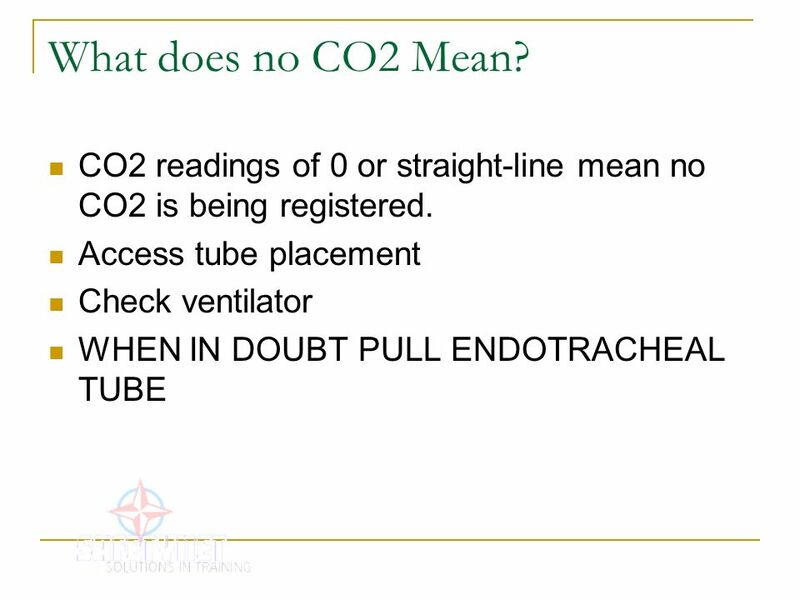 The presence of CO2 (evidenced by a color change on the colorimetric device or number/light on the electronic monitor) suggests tracheal tube placement. 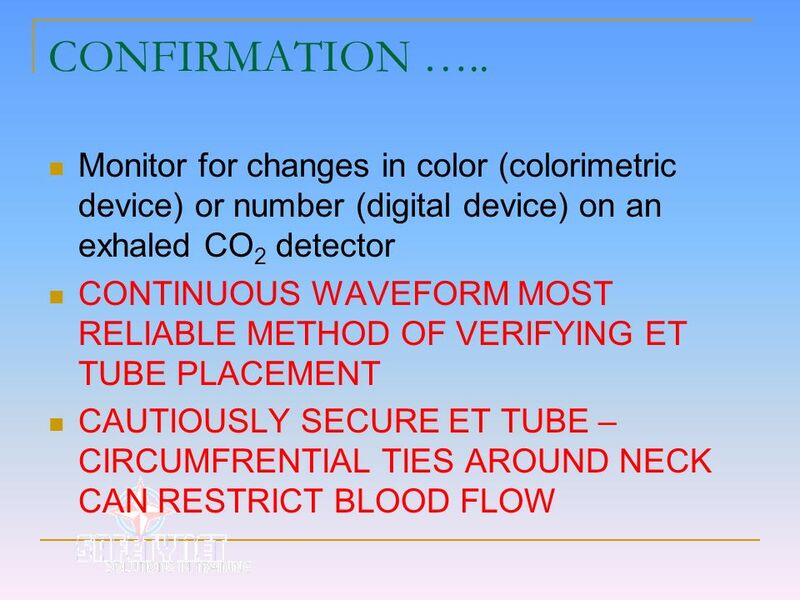 A lack of CO2 (no color change on colorimetric detector or indicator on the electronic monitor) suggests tube placement in the esophagus, particularly in patients with spontaneous circulation. 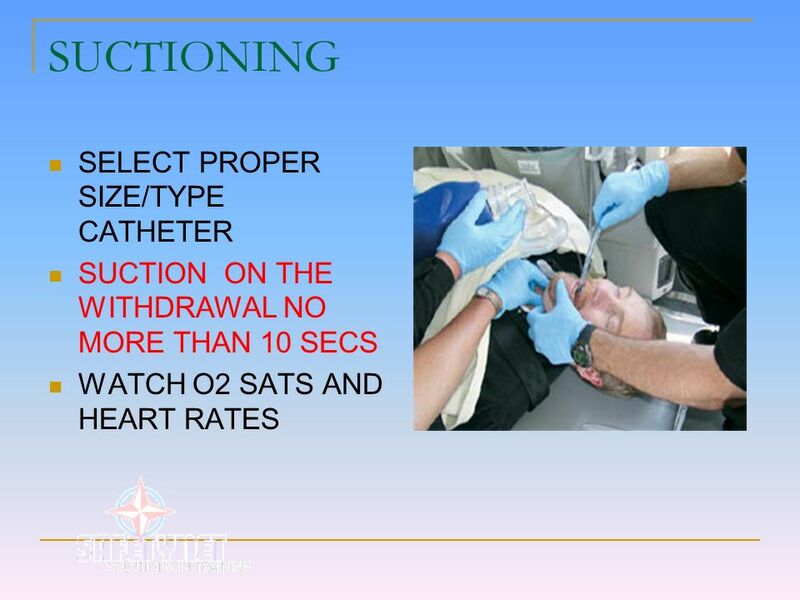 Because CO2 may inadvertently enter the stomach, ventilate the patient at least six times before evaluating ET tube placement using an exhaled CO2 detector to quickly wash out any retained CO2. In animals, false-positive results (CO2 is detected despite tube placement in the esophagus) have been reported when large amounts of carbonated beverages were ingested before a cardiac arrest. 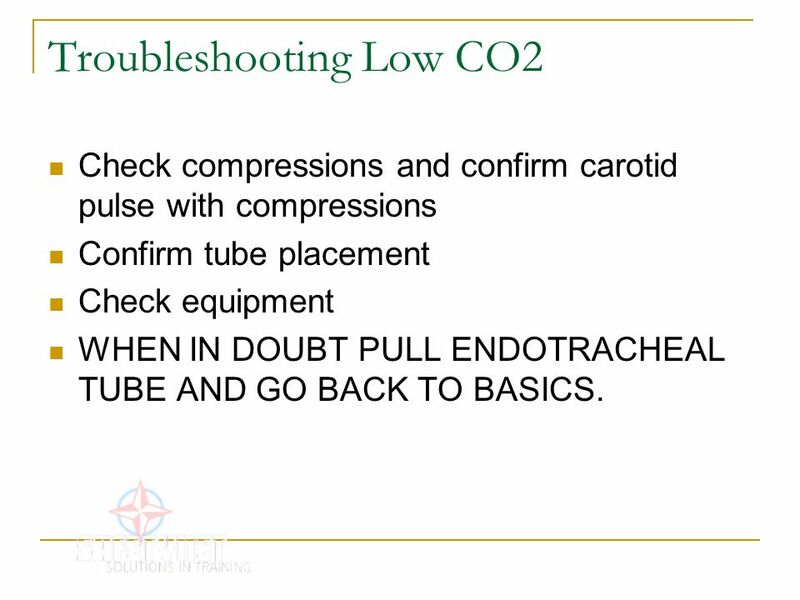 False-negative results (lack of CO2 detection despite tube placement in the trachea) may occur in cardiac arrest or in a patient who has a significant pulmonary embolus because of reduced delivery of CO2 to the lungs. 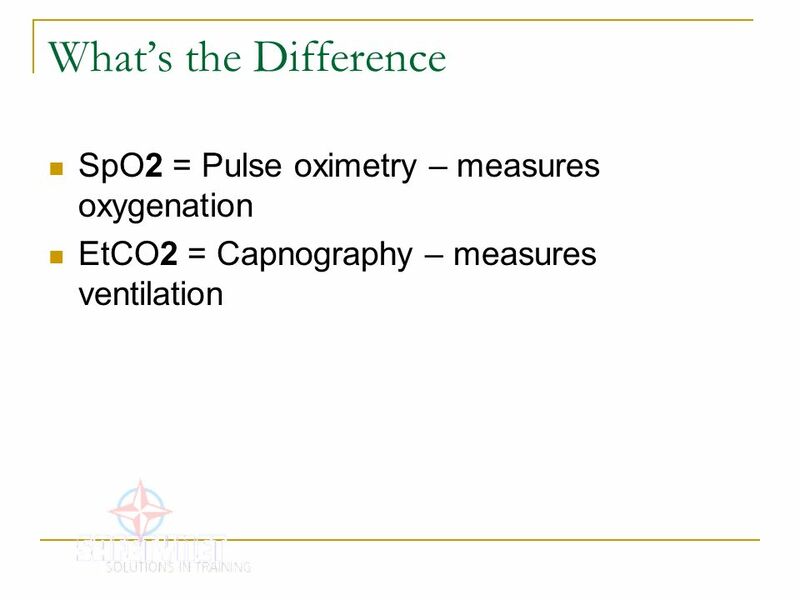 39 What is capnography? 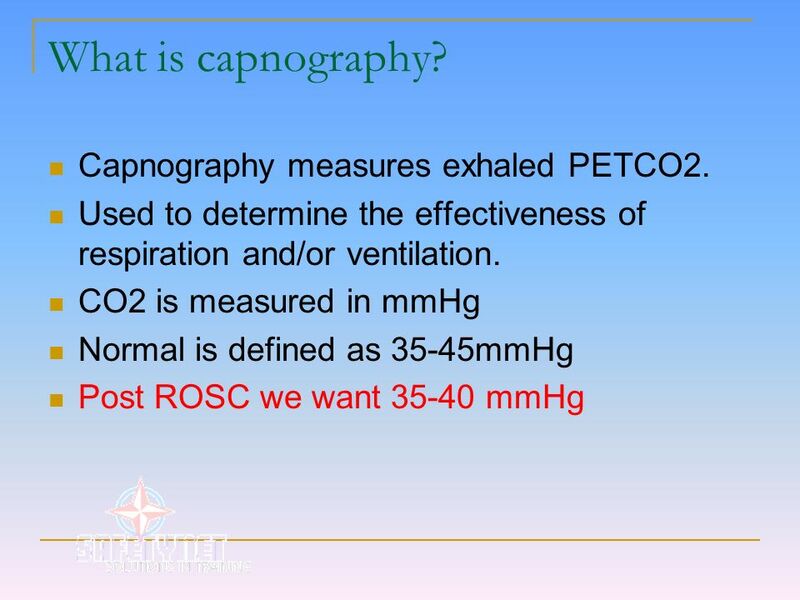 Capnography measures exhaled PETCO2. 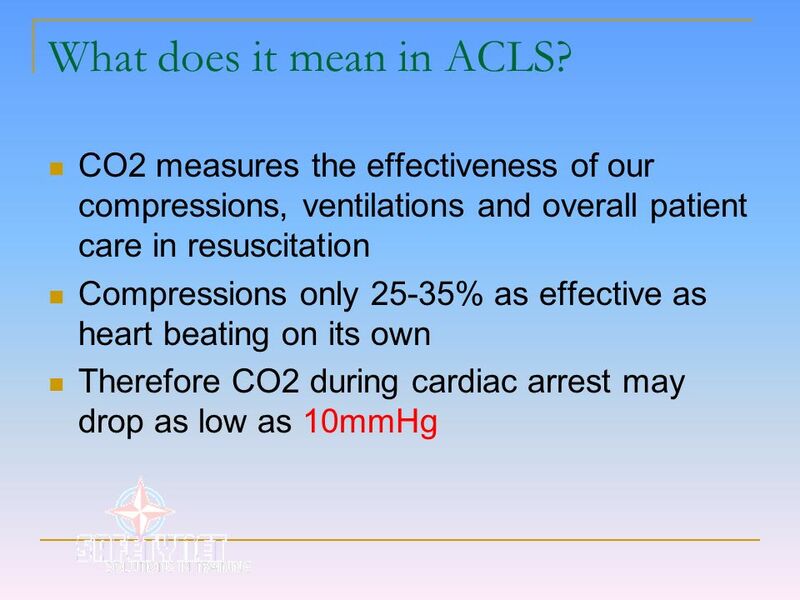 42 What does it mean in ACLS? 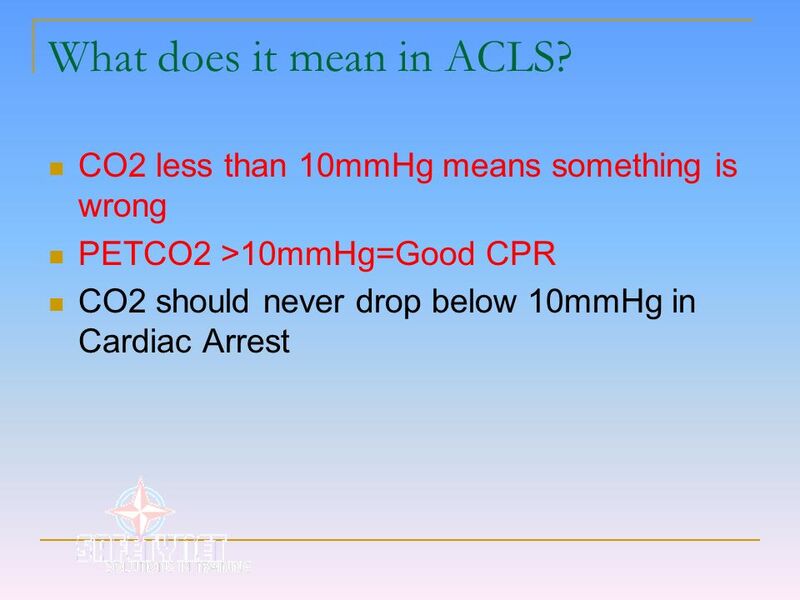 43 What does it mean in ACLS? 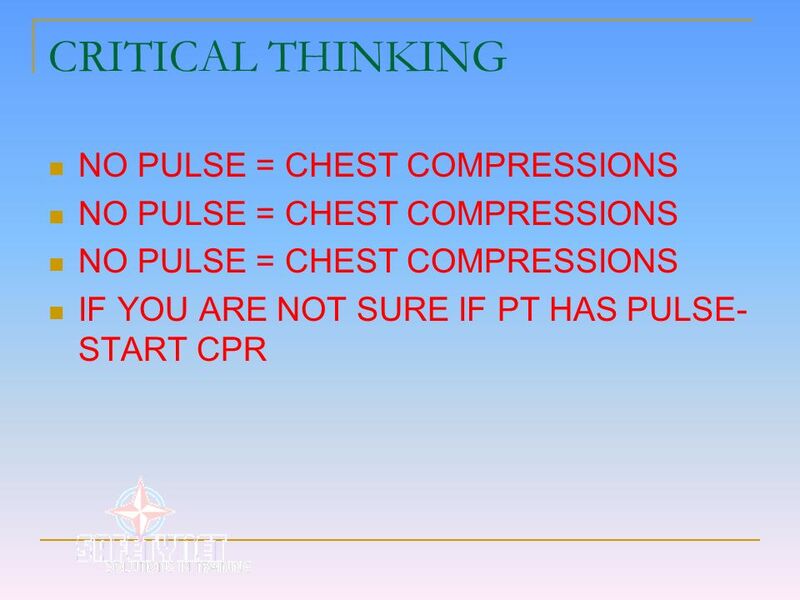 Check compressions and confirm carotid pulse with compressions Confirm tube placement Check equipment WHEN IN DOUBT PULL ENDOTRACHEAL TUBE AND GO BACK TO BASICS. 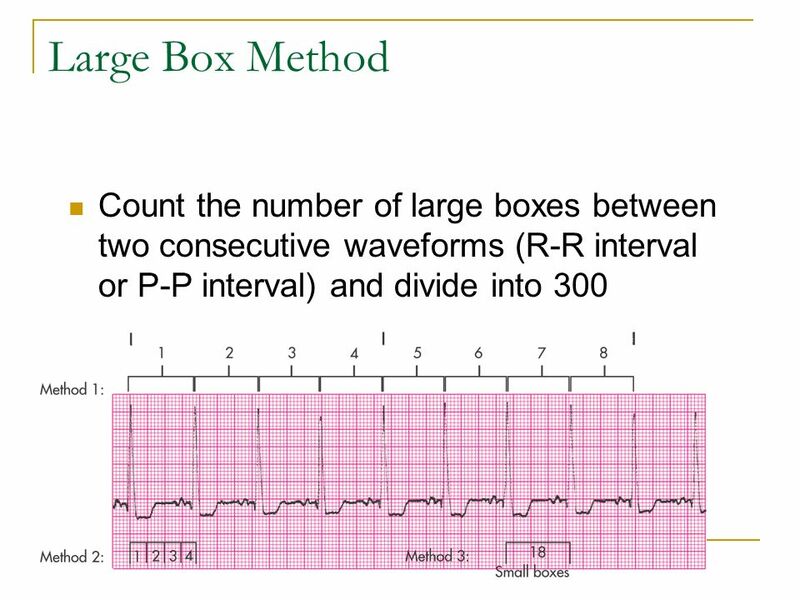 51 Large Box Method Count the number of large boxes between two consecutive waveforms (R-R interval or P-P interval) and divide into 300 To determine the ventricular rate, count the number of large boxes between two consecutive R waves (R-R interval) and divide into 300. 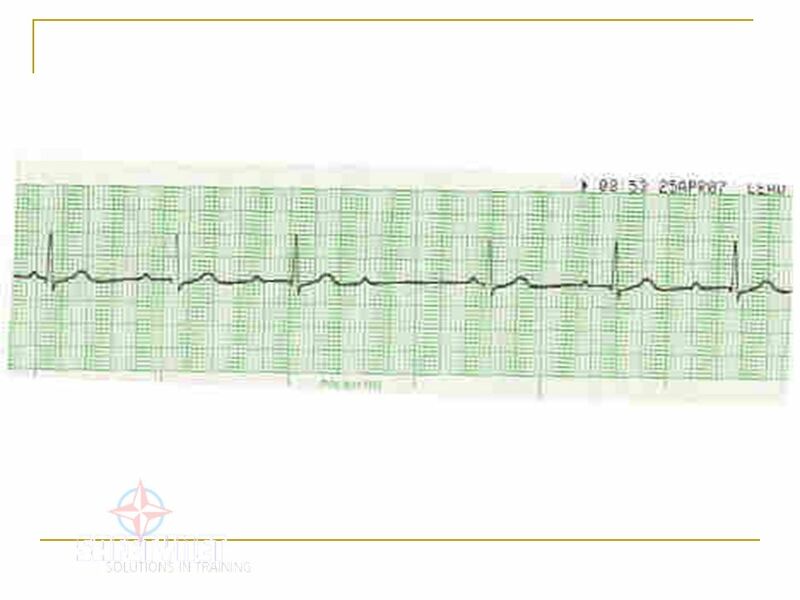 To determine the atrial rate, count the number of large boxes between two consecutive P waves (P-P interval) and divide into 300. This method is best used if the rhythm is regular; however, it may be used if the rhythm is irregular and a rate range (slowest and fastest rate) is given. SQUIGGLY LINE-LOOKS LIKE A KID DRAWING ON A WALL !! 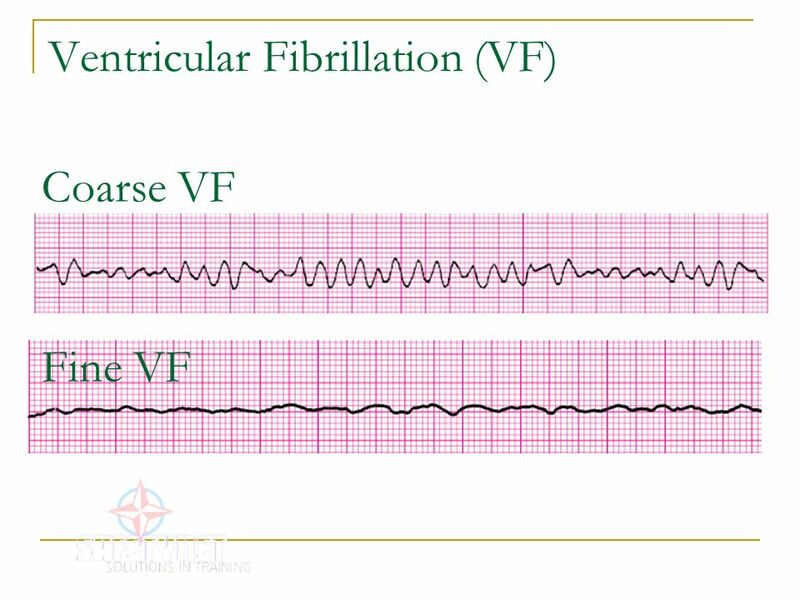 Coarse VF Fine VF Ventricular fibrillation (VF) is a chaotic rhythm that begins in the ventricles. 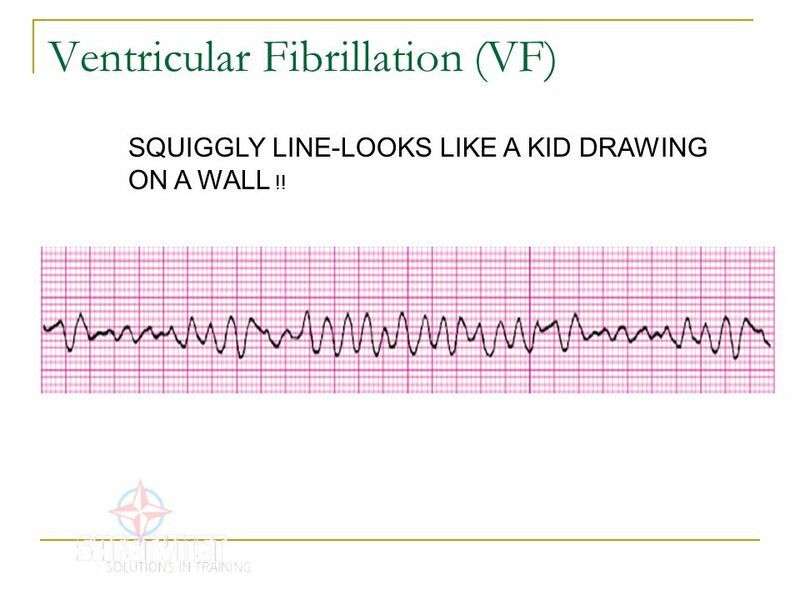 In VF, there is no organized depolarization of the ventricles. The ventricular muscle quivers. 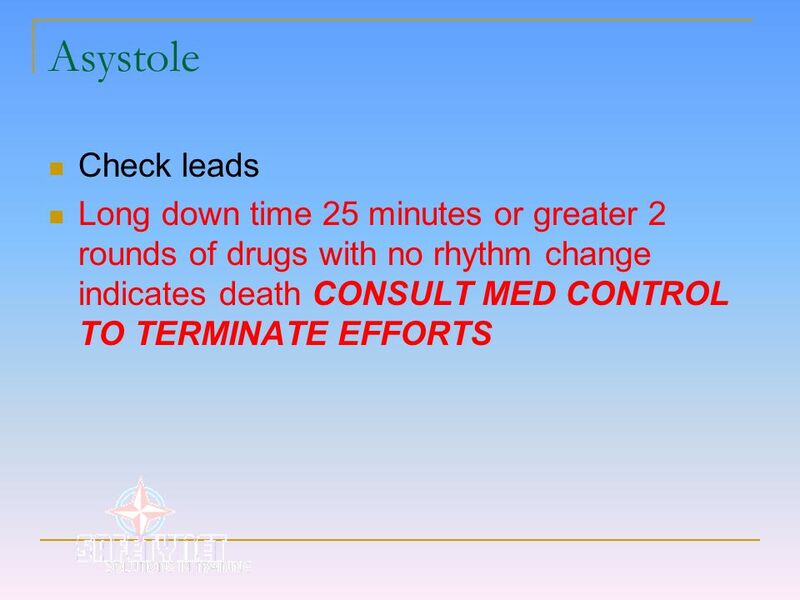 As a result, there is no effective myocardial contraction and no pulse. 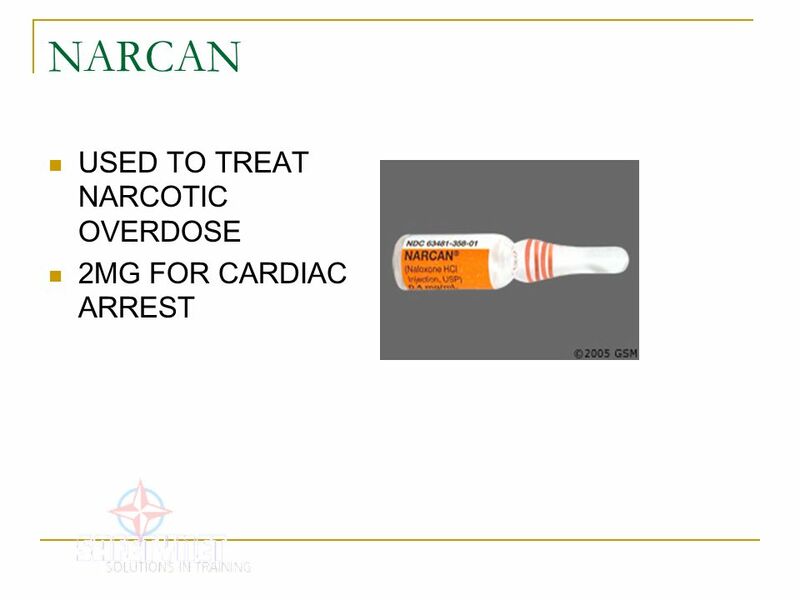 Since no drugs used in cardiac arrest have been shown to improve survival to hospital discharge, the priorities of care in cardiac arrest due to pulseless VT or VF are CPR and defibrillation. 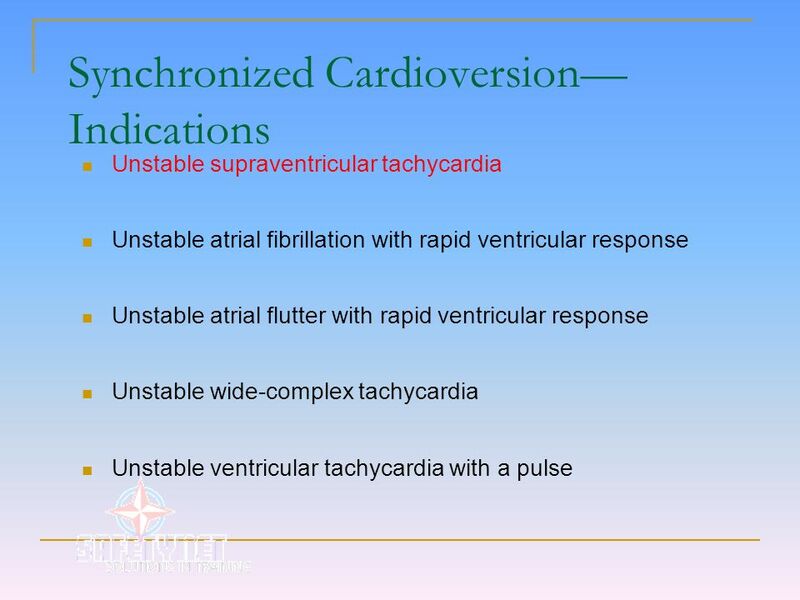 Ventricular tachycardia exists when three or more PVCs occur in immediate succession at a rate greater than 100 beats per minute. 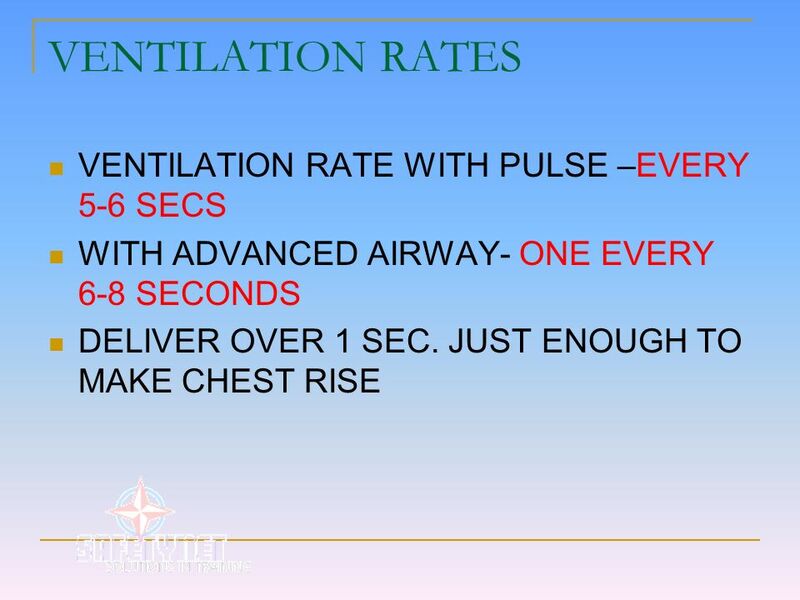 VT may occur as a short run lasting less than 30 seconds (non-sustained) but more commonly persists for more than 30 seconds (sustained). 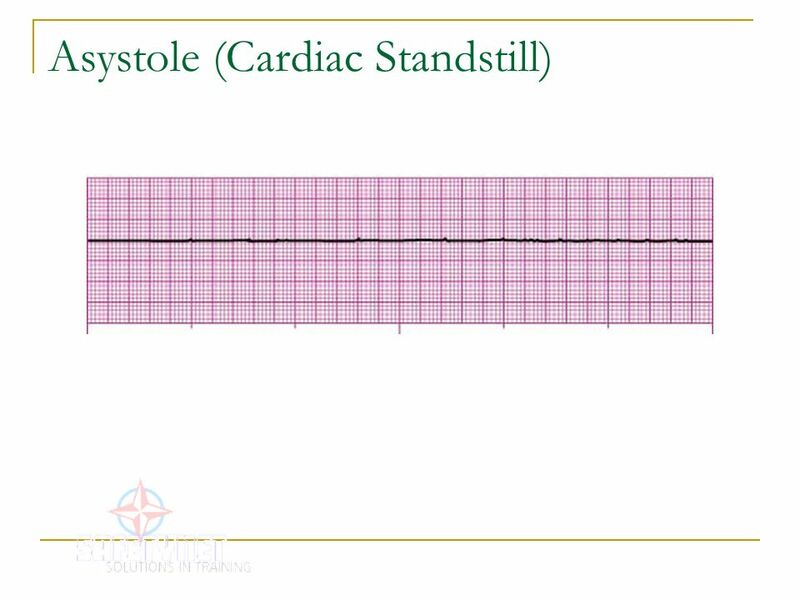 VT may occur with or without pulses and the patient may be stable or unstable with this rhythm. 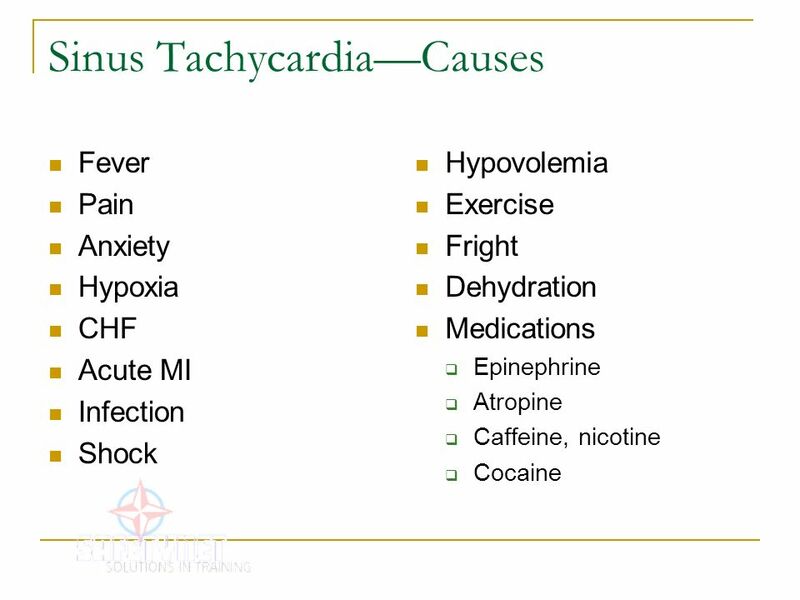 Ventricular tachycardia, like PVCs, may originate from an ectopic focus in either ventricle. In VT, the QRS complex is wide and bizarre. 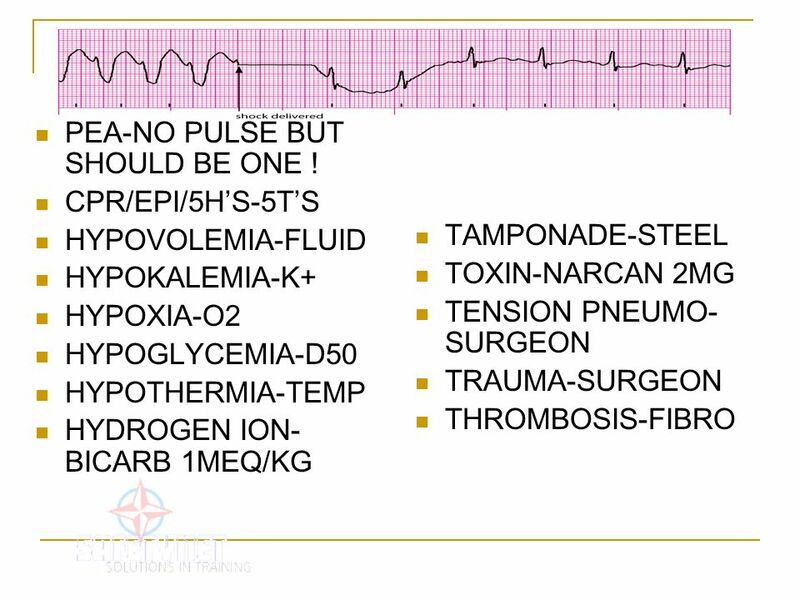 P waves, if visible, bear no relationship to the QRS complex. 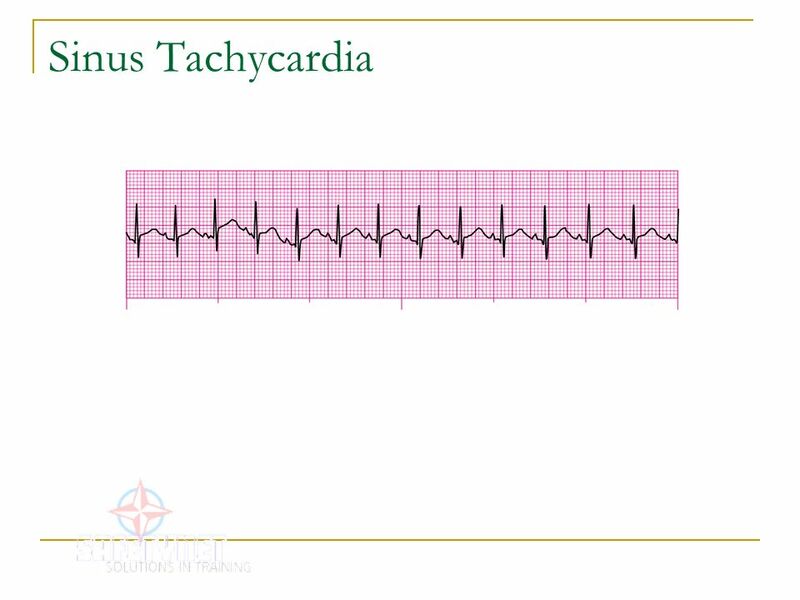 The ventricular rhythm is usually regular but may be slightly irregular. 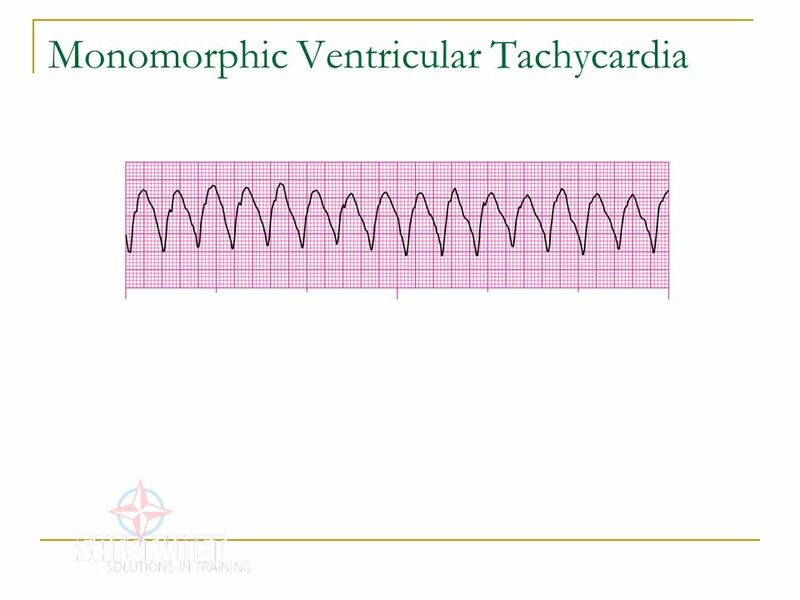 When the QRS complexes of VT are of the same shape and amplitude, the rhythm is termed monomorphic VT. 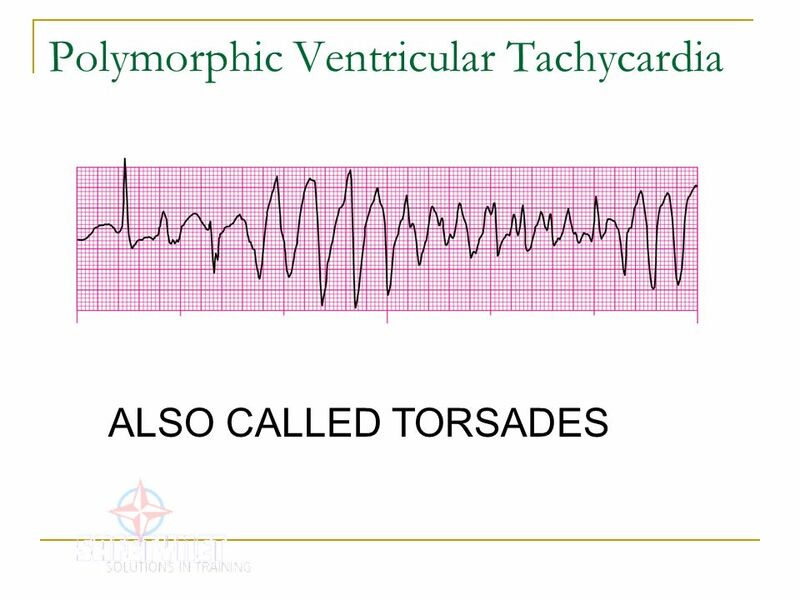 When the QRS complexes of VT vary in shape and amplitude, the rhythm is termed polymorphic VT (see irregular tachycardias). 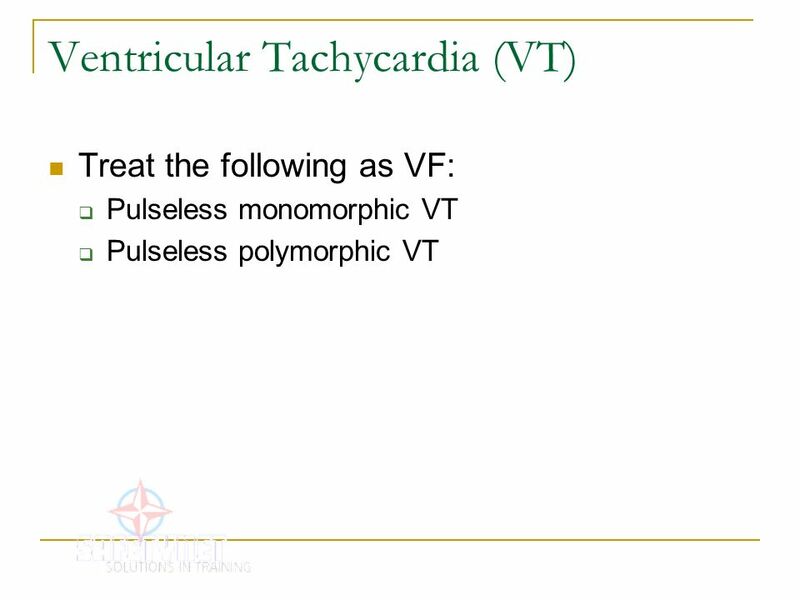 Treat the following as VF: Pulseless monomorphic VT Pulseless polymorphic VT Monomorphic VT and polymorphic VT have already been discussed. If either of these rhythms presents without a pulse, the rhythm is treated as VF. 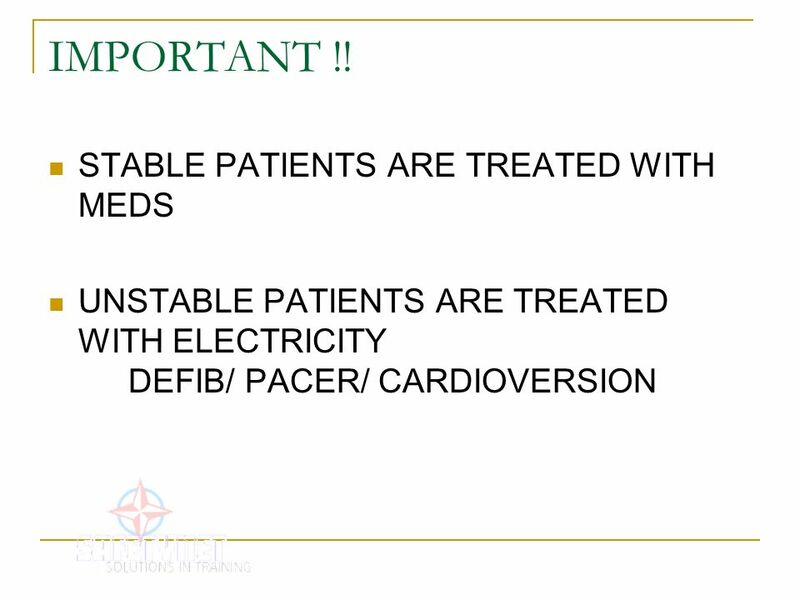 Asystole is a total absence of ventricular electrical activity. 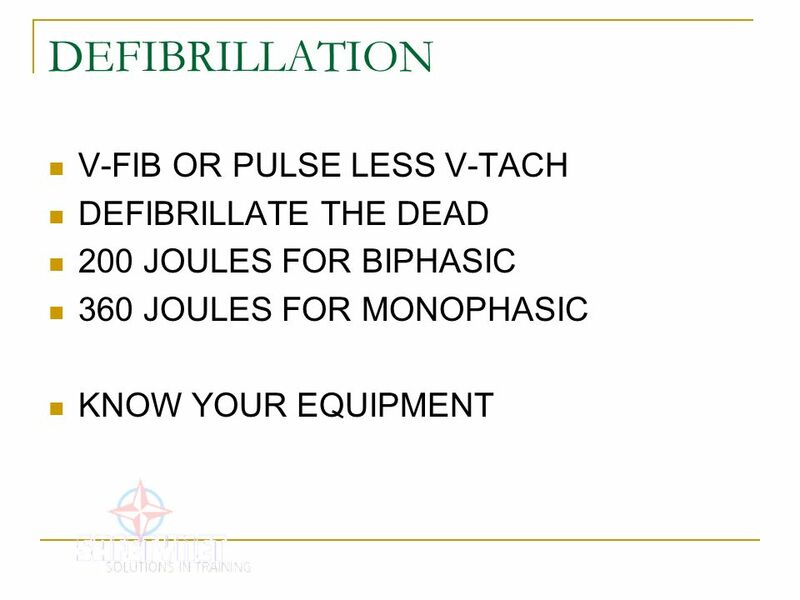 There is no ventricular rate or rhythm, no pulse, and no cardiac output. 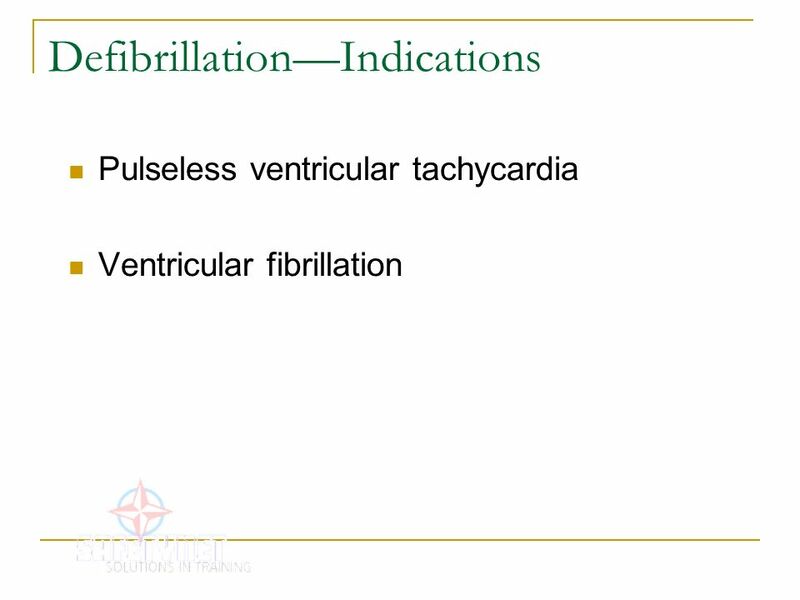 Some atrial electrical activity may be evident. 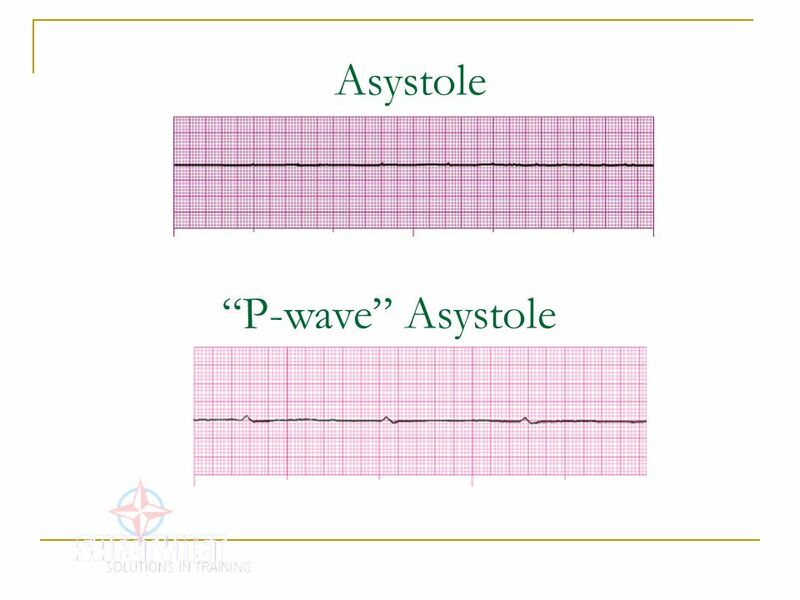 If atrial electrical activity is present, the rhythm is called “P-wave” asystole or ventricular standstill. Confirm there is no pulse, begin immediate CPR, and confirm the rhythm in two leads. 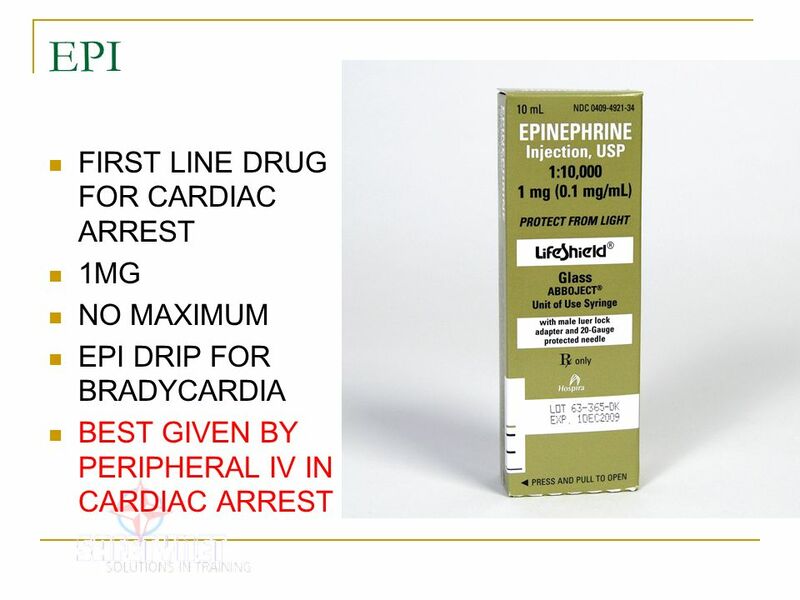 If the rhythm is confirmed as asystole, additional care includes starting an IV, considering the possible causes of the arrest, possible insertion of an advanced airway, epinephrine, and atropine. 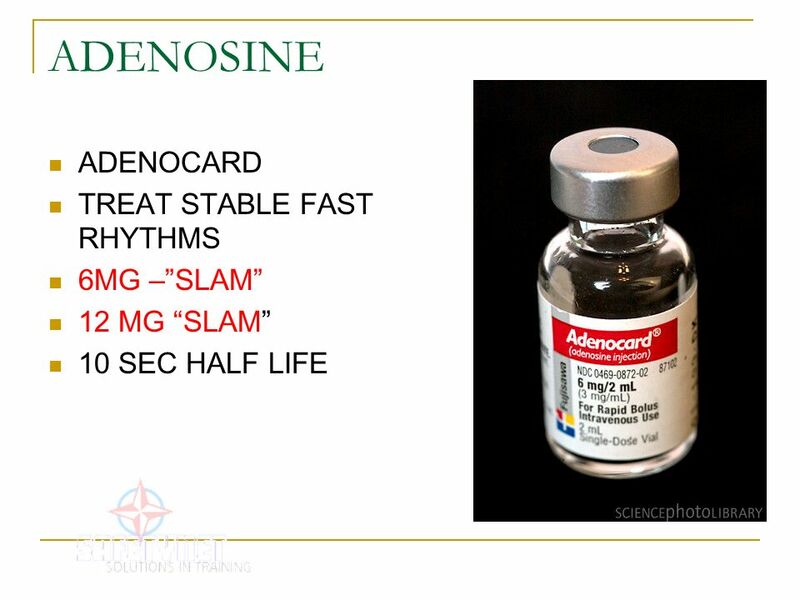 62 Sinus Bradycardia If the SA node fires at a rate slower than normal for the patient’s age, the rhythm is called sinus bradycardia. The rhythm starts in the SA node and then heads down the normal pathway of conduction through the atria, AV junction, bundle branches, and ventricles. 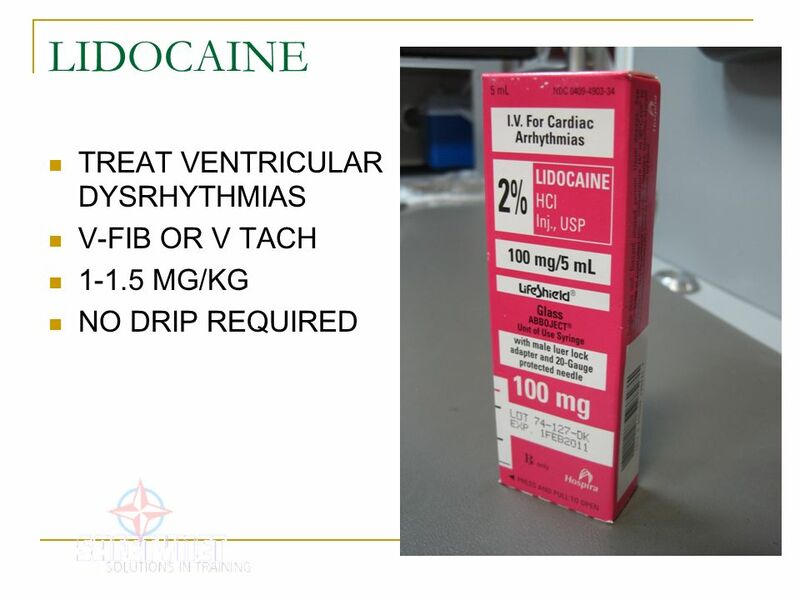 This results in atrial and ventricular depolarization. 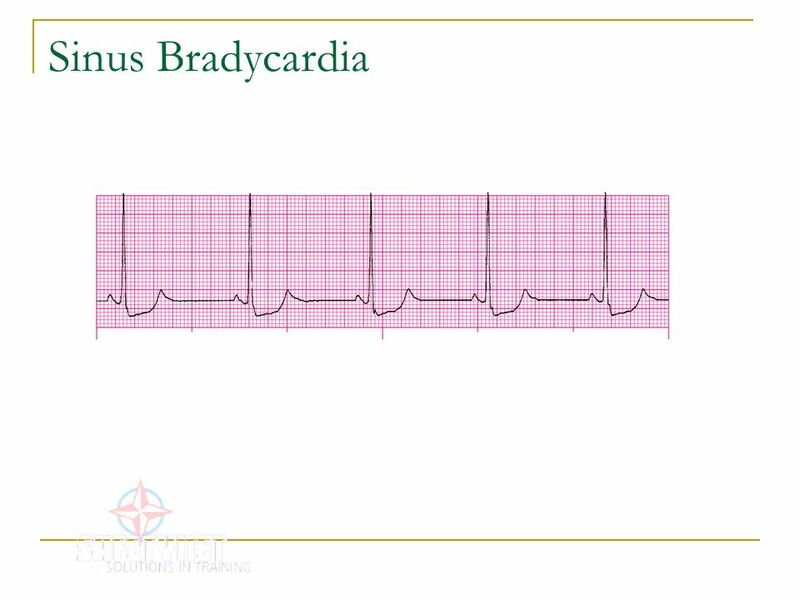 In adults and adolescents, a sinus bradycardia has a heart rate of less than 60 bpm. 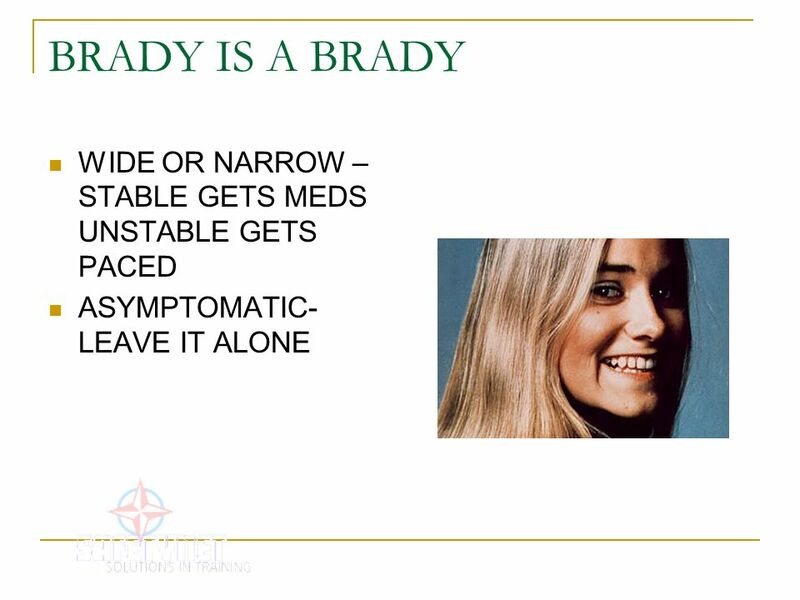 The term severe sinus bradycardia is sometimes used to describe a sinus bradycardia with a rate of less than 40 bpm. 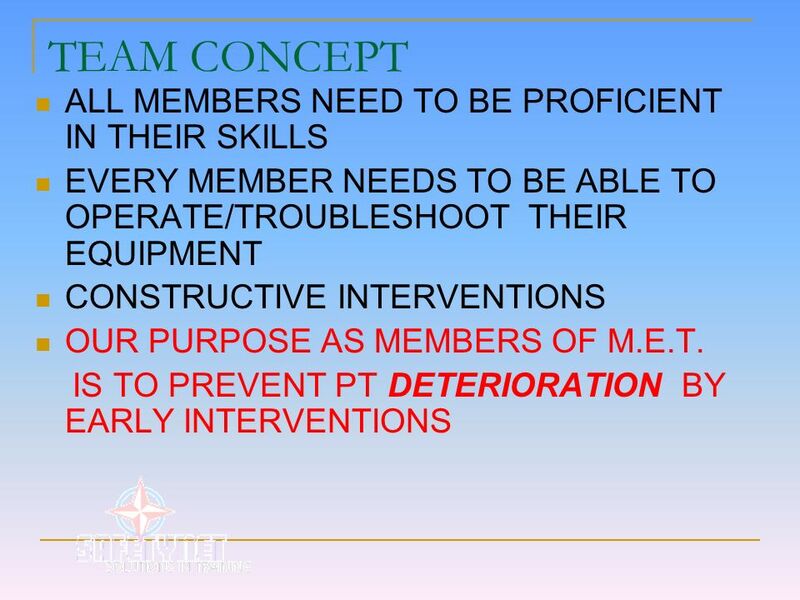 Assess how the patient tolerates the rhythm at rest and with activity. 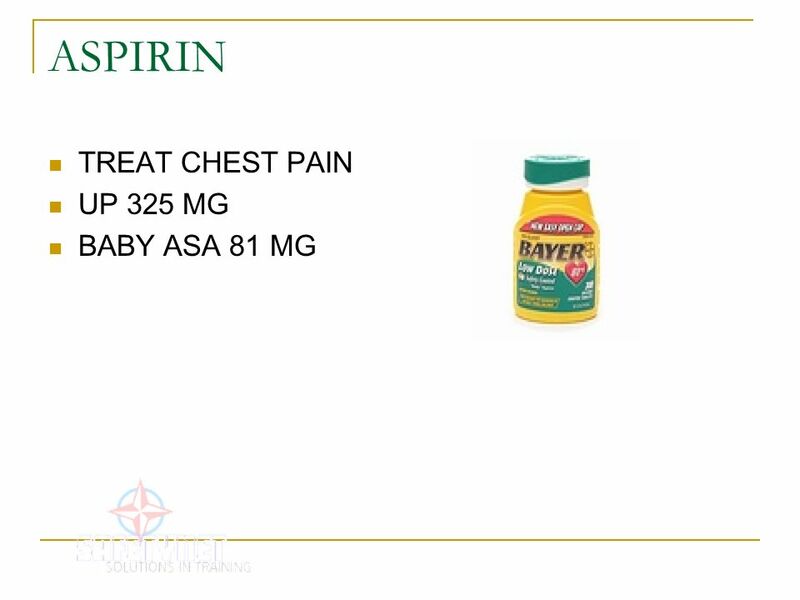 If the patient has no symptoms, no treatment is necessary. 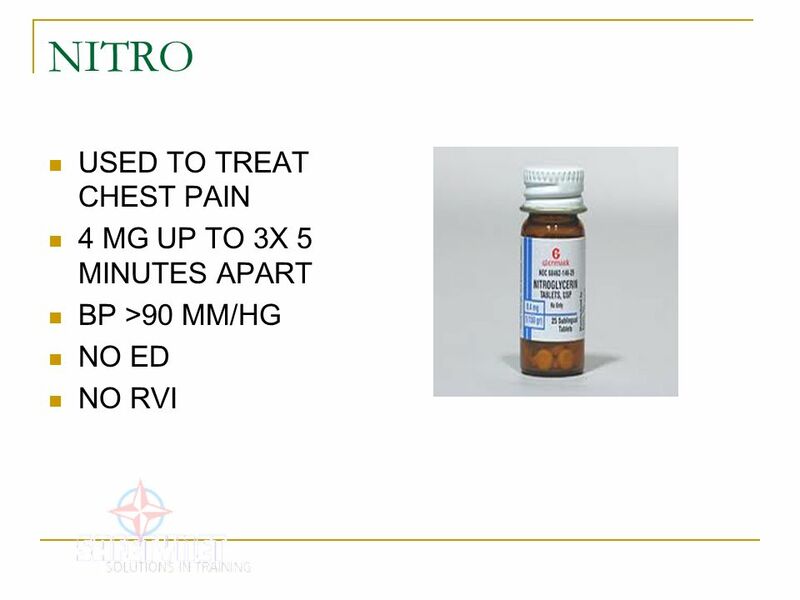 If the patient is symptomatic because of the slow rate, initial treatment may include O2, starting an IV, giving IV atropine, and/or transcutaneous pacing. 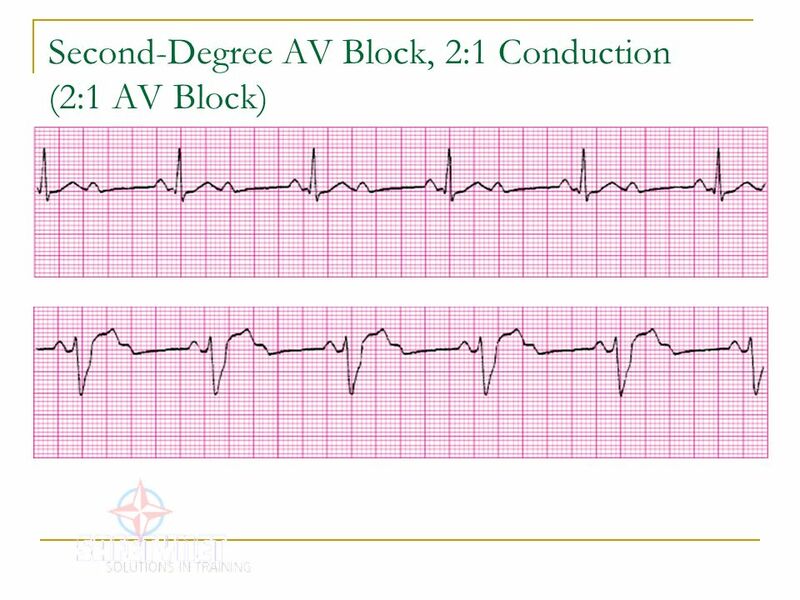 The conduction delay in second-degree AV block type II occurs below the AV node, either at the bundle of His or, more commonly, at the level of the bundle branches. 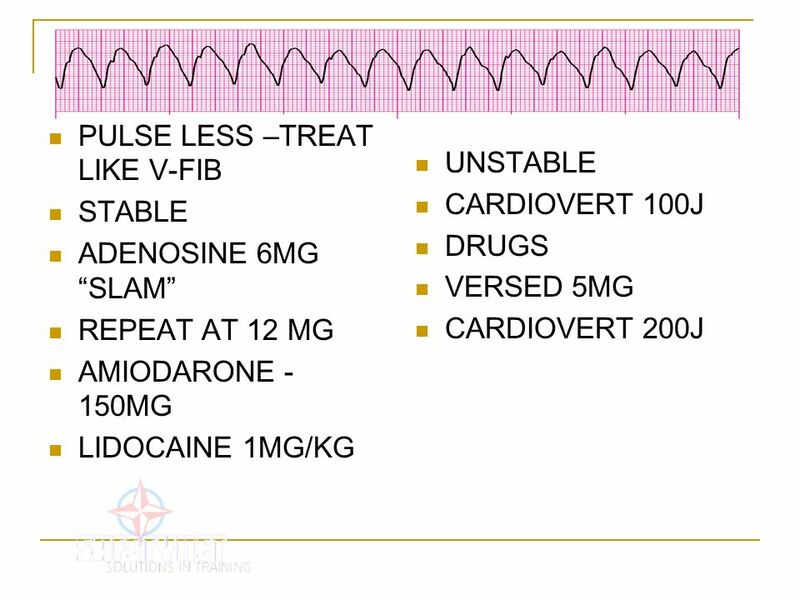 This type of block is more serious than second-degree AV block type I and often progresses to third-degree AV block. 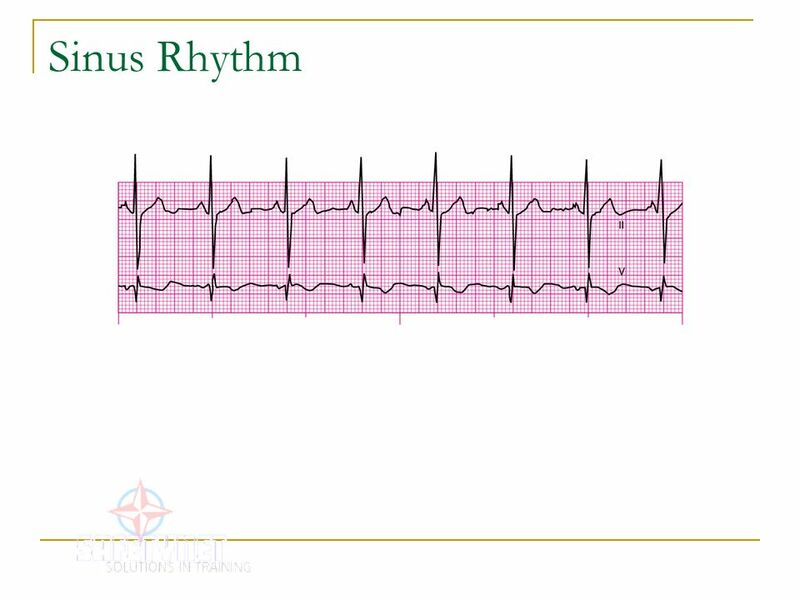 Preparations should be made for pacing when this rhythm is recognized. 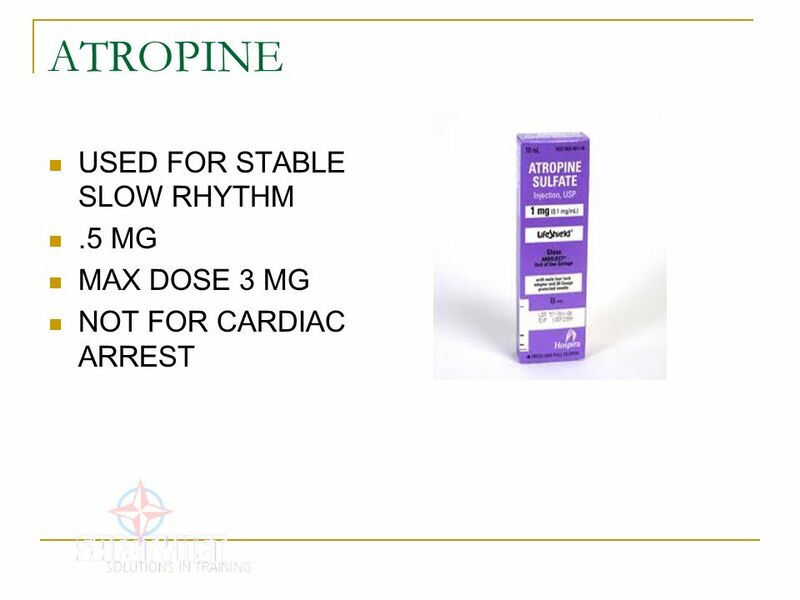 The use of atropine should be avoided. 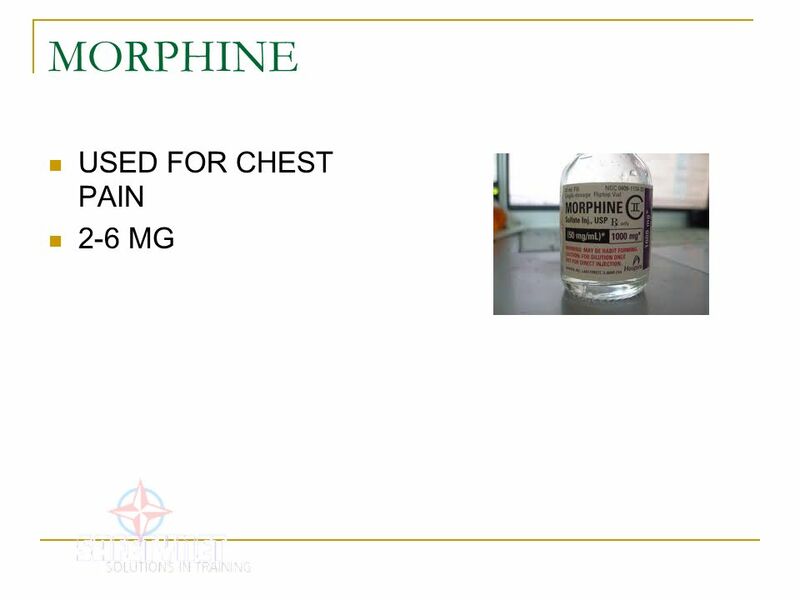 In this situation, atropine will usually not improve the block but will increase the rate of discharge of the SA node. 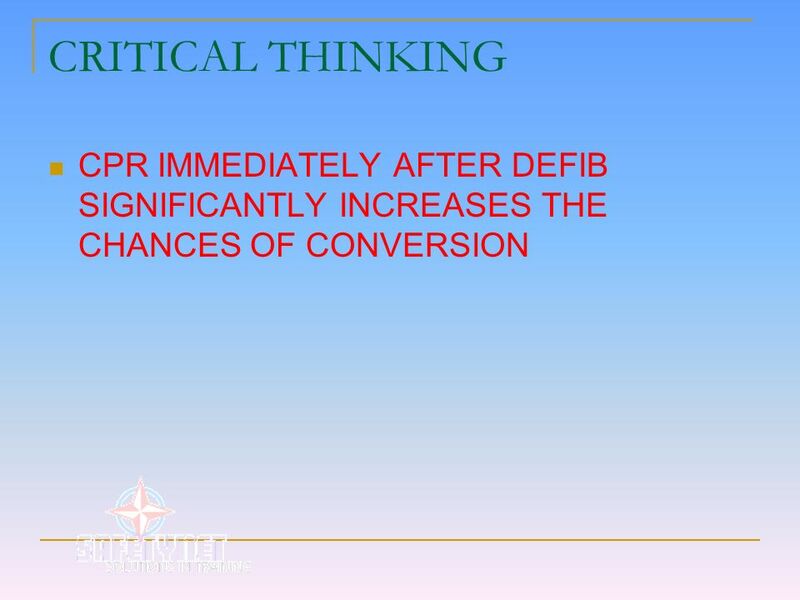 This may trigger a situation in which even fewer impulses are conducted through to the ventricles and the ventricular rate is further slowed. In 2:1 AV block, two P waves occur for every one QRS complex (2:1 conduction). 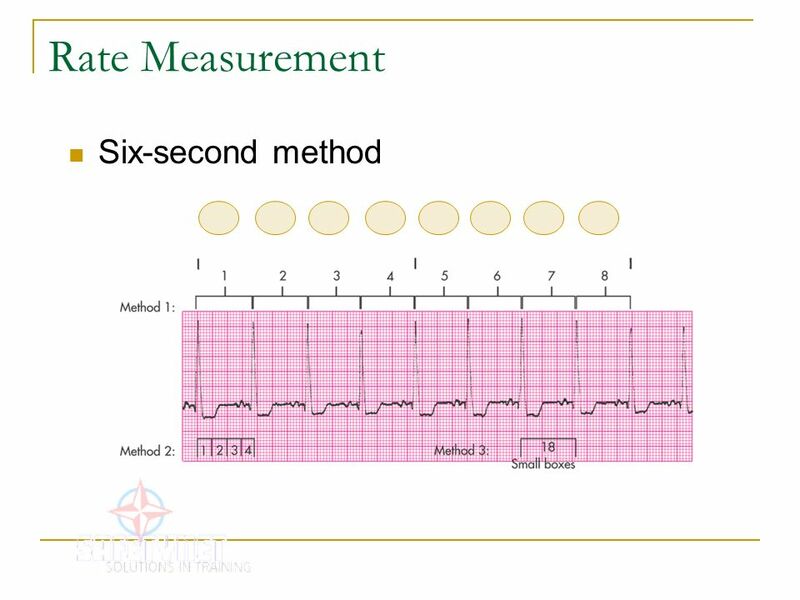 Since there are no two PQRST cycles in a row from which to compare PR intervals, the decision as to what to term the rhythm is based on the width of the QRS complex. 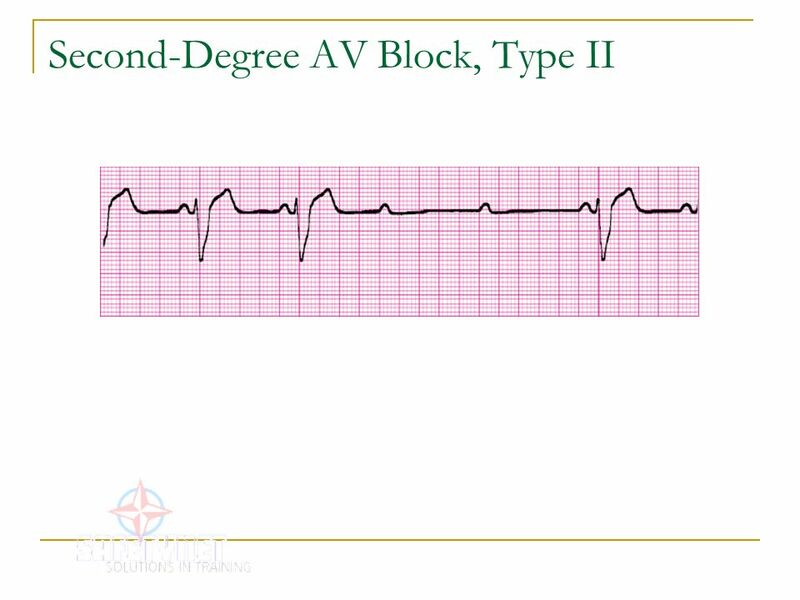 A 2:1 AV block associated with a narrow QRS complex (0.10 sec or less) usually represents a form of second-degree AV block, type I. 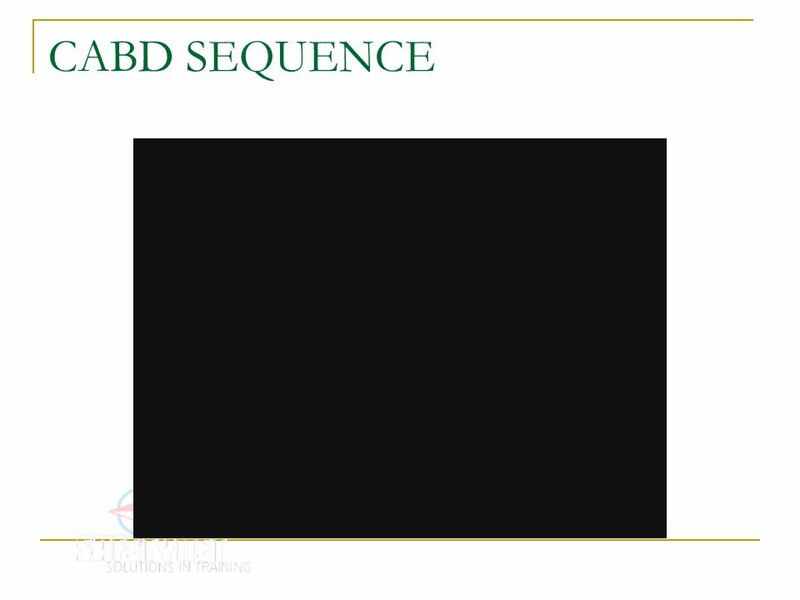 A 2:1 AV block associated with wide QRS complexes (greater than 0.10 sec) is usually associated with a delay in conduction below the bundle of His—thus it is usually a type II block. 66 Third-degree AV Block Third-degree AV block associated with an inferior MI is thought to be the result of a block above the bundle of His. 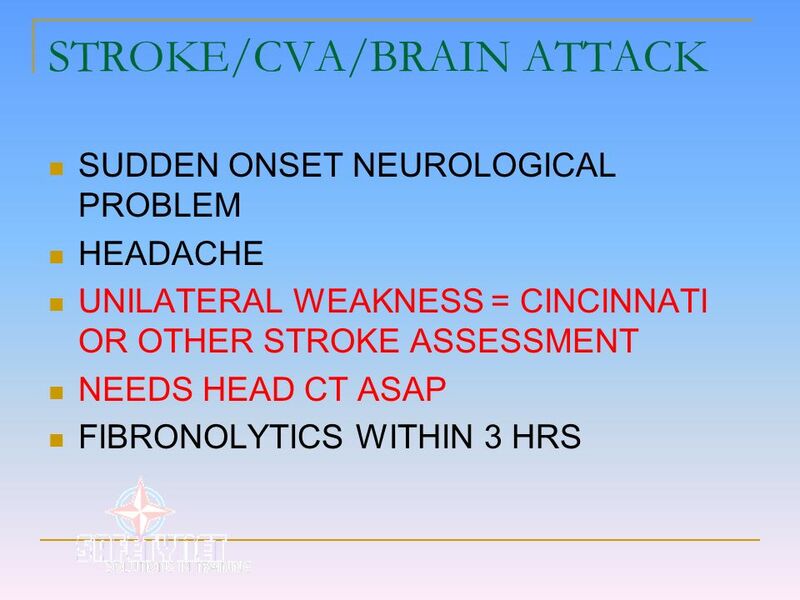 It often occurs after progression from first-degree AV block or second-degree AV block type I. 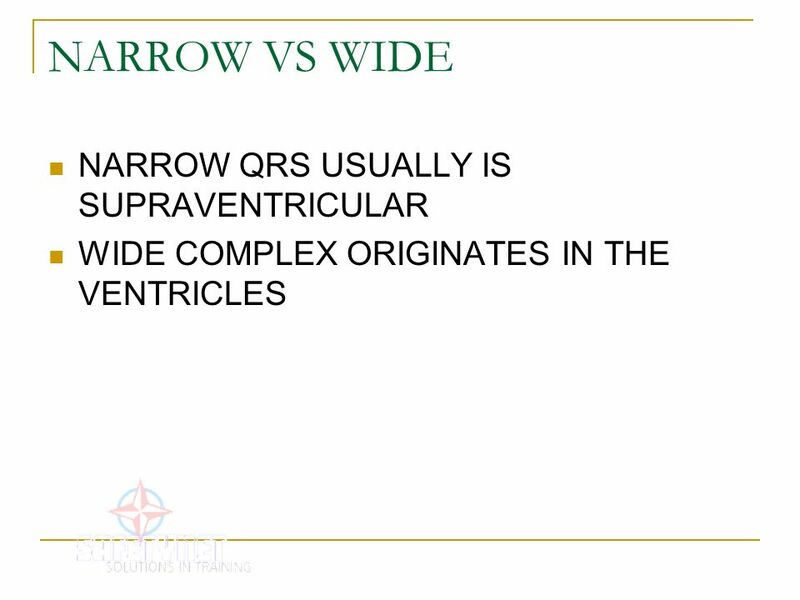 The resulting rhythm is usually stable because the escape pacemaker is usually junctional (narrow QRS complexes) with a ventricular rate of more than 40 bpm. 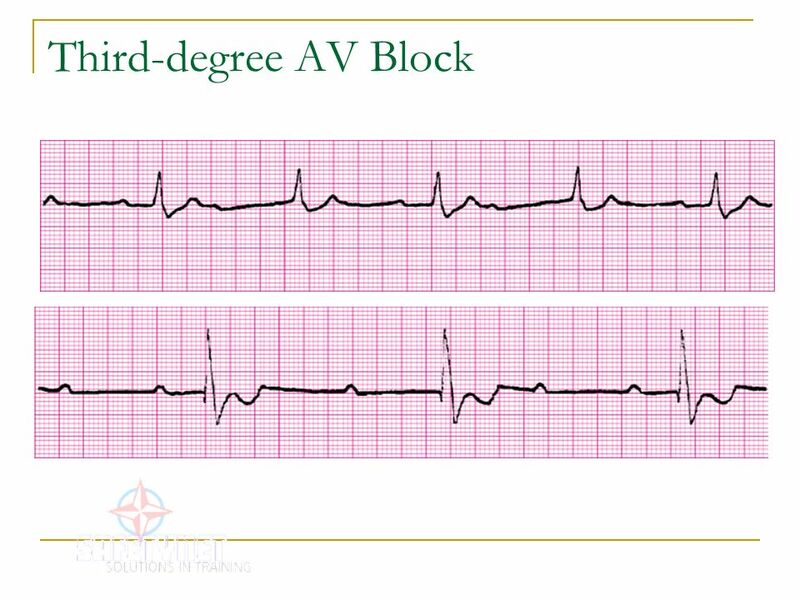 Third-degree AV block associated with an anterior MI is usually preceded by second-degree AV block type II or an intraventricular conduction delay (right or left bundle branch block). 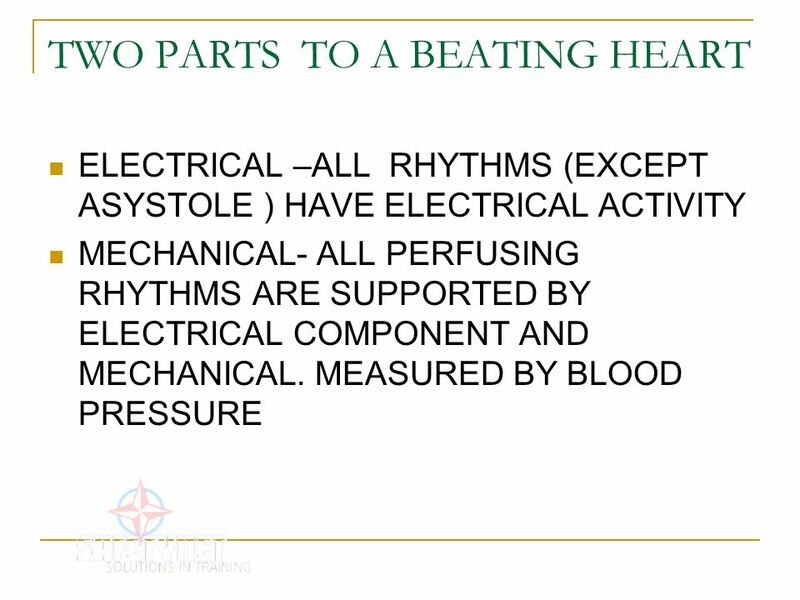 The resulting rhythm is usually unstable because the escape pacemaker is usually ventricular (wide QRS complexes) with a ventricular rate of less than 40 bpm. 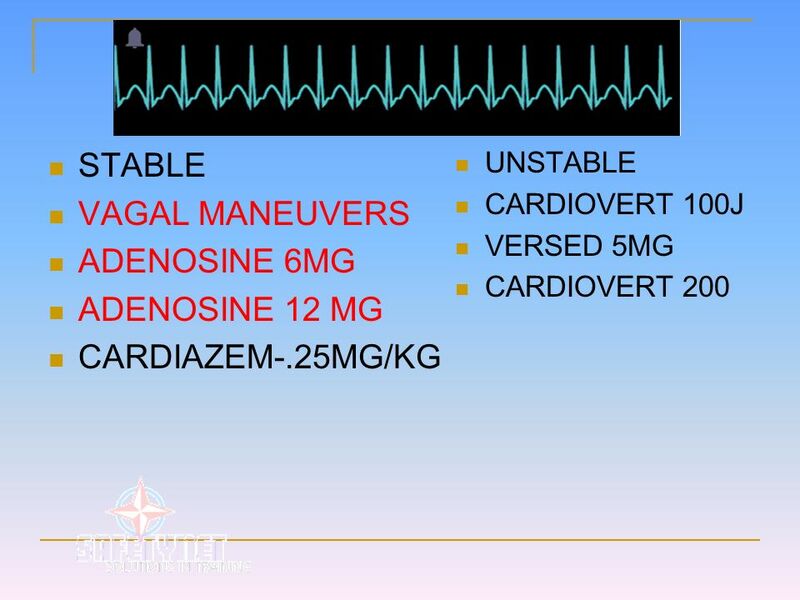 The patient’s signs and symptoms will depend on the origin of the escape pacemaker (junctional vs. ventricular) and the patient’s response to a slower ventricular rate. 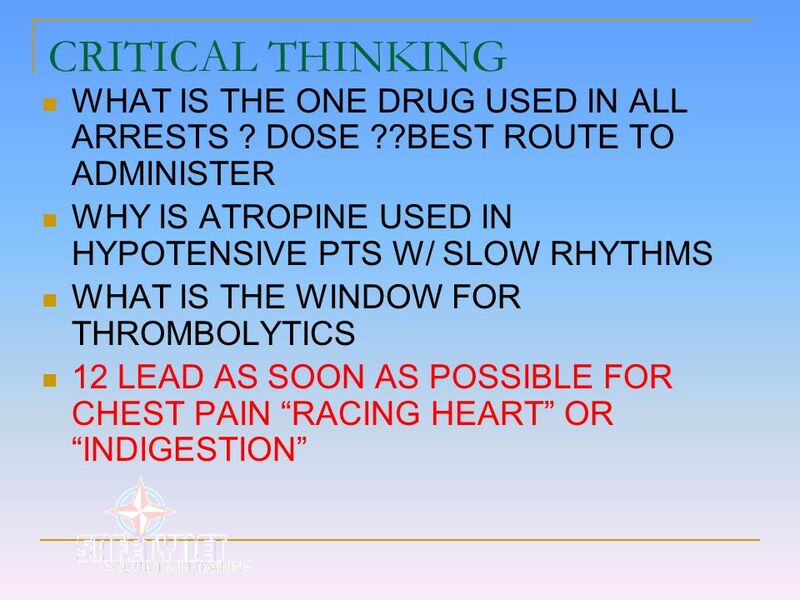 If the QRS is narrow and the patient is symptomatic due to the slow rate, initial management consists of atropine and/or transcutaneous pacing. 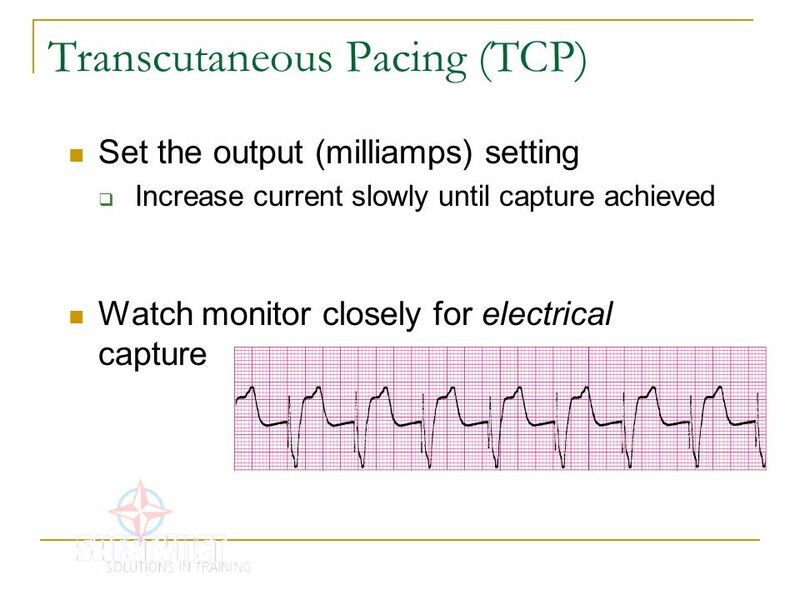 If the QRS is wide and the patient is symptomatic due to the slow rate, transcutaneous pacing should be instituted while preparations are made for insertion of a transvenous pacemaker. 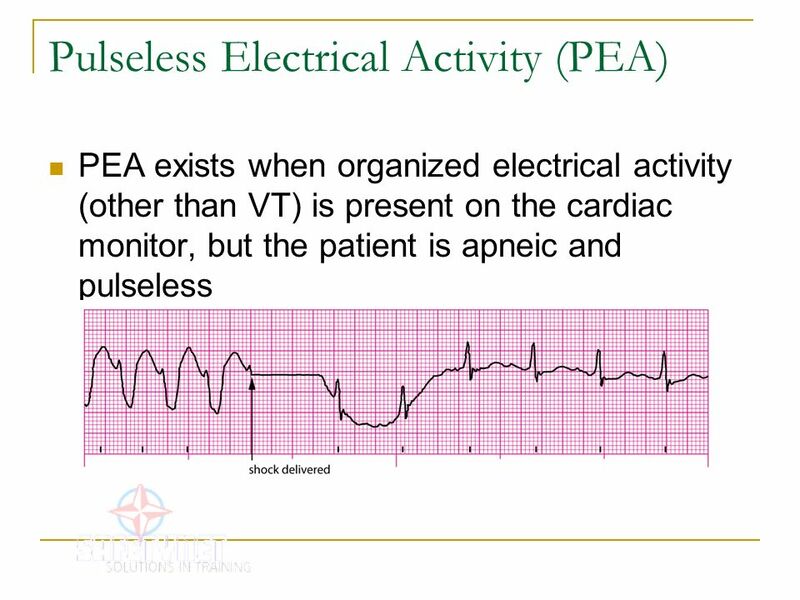 PEA exists when organized electrical activity (other than VT) is present on the cardiac monitor, but the patient is apneic and pulseless Pulseless electrical activity is a clinical situation, not a specific dysrhythmia. 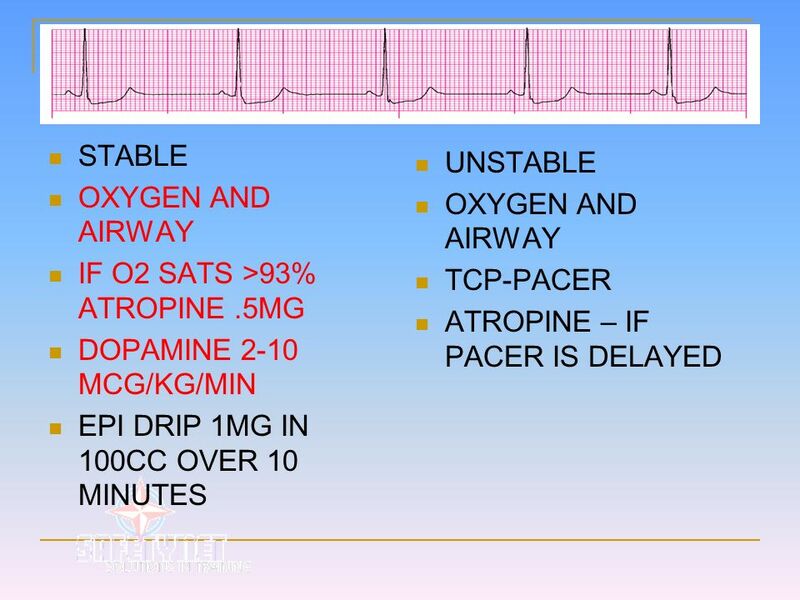 PEA exists when organized electrical activity (other than VT) is observed on the cardiac monitor, but the patient is unresponsive, not breathing, and a pulse cannot be felt. 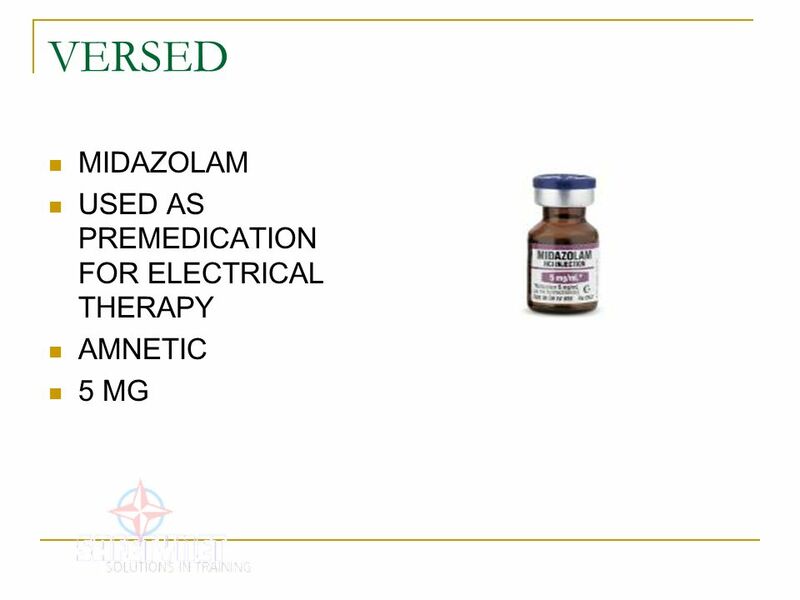 PEA was formerly called EMD – electromechanical dissociation. The term was changed from EMD to PEA because research using ultrasonography and indwelling pressure catheters revealed that the electrical activity seen in some of these situations is associated with mechanical contractions – the contractions are simply too weak to produce a palpable pulse or measurable blood pressure. PEA has a poor prognosis unless the underlying cause can be rapidly identified and appropriately managed. 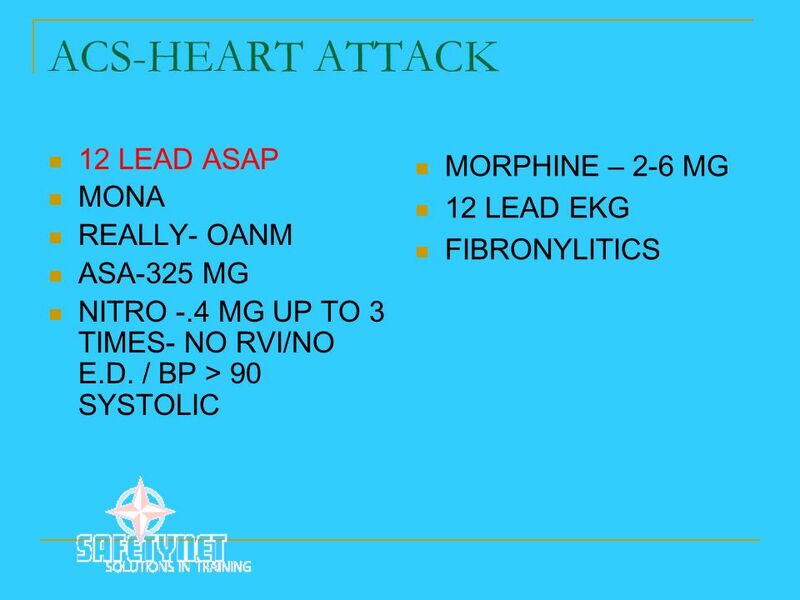 Treatment includes CPR, O2, IV access, possible insertion of an advanced airway, IV access, giving epinephrine (and atropine if the rate is slow), and an aggressive search for possible causes of the situation. 76 Paddle/Pad Position Hand-held paddles or combination pads should be placed on the patient’s bare chest according to the manufacturer’s instructions. 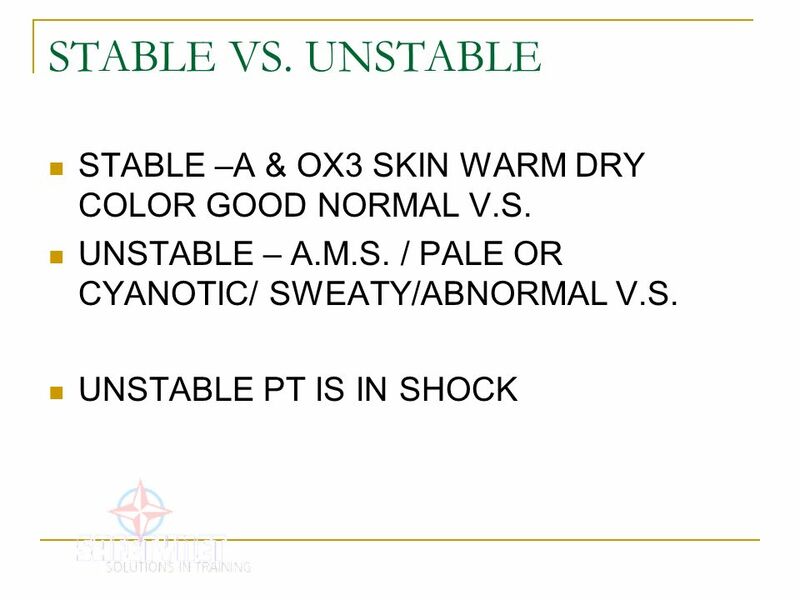 Paddles or pads may be labeled according to their position on the chest (sternum/apex, front/back) or according to their polarity (positive, negative). When preparing the skin for paddle or pad placement, do not use alcohol, tincture of benzoin, or antiperspirant. 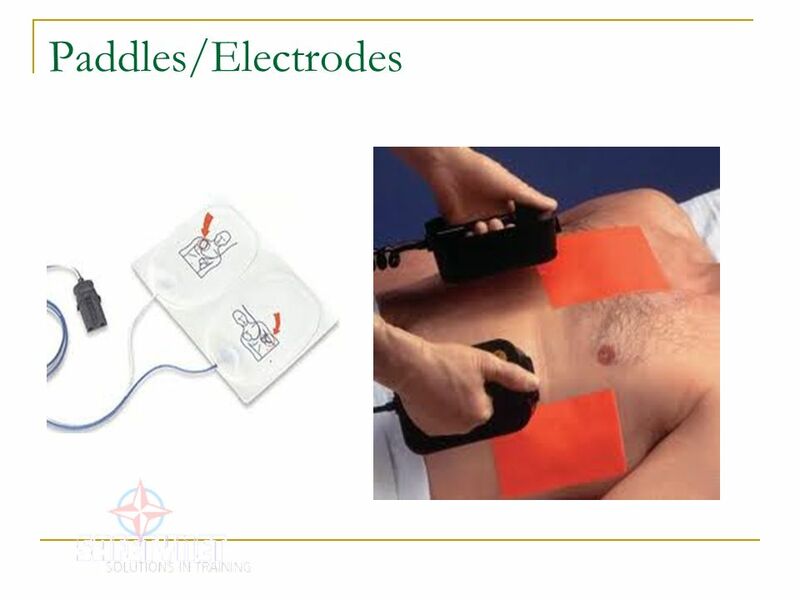 When positioning paddles or pads, be sure that they do not overlap bone (such as the sternum, spine, or scapulae) because bone is not a good conductor of current. The typical paddle/pad position used during resuscitation is the sternum-apex position (also called the anterolateral or apex-anterior position). 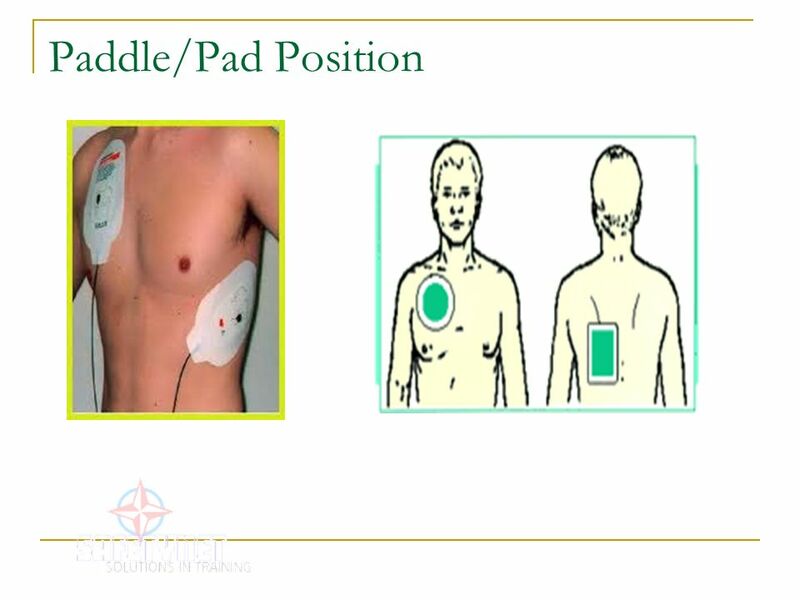 This position is often used because the anterior chest is usually easy to get to and placement of the paddles/pads in this position approximates ECG electrode positioning in lead II. Place the right (sternum) paddle/pad to the right of the sternum, just below the clavicle. Place the center of the left (apex) paddle/pad in the midaxillary line, about level with the V6 ECG electrode position (about the fifth intercostal space). 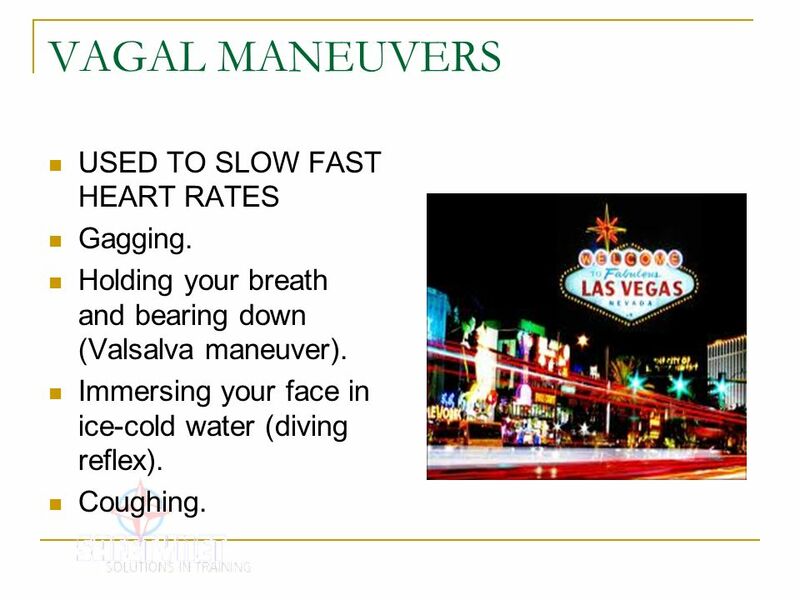 79 VAGAL MANEUVERS USED TO SLOW FAST HEART RATES Gagging. 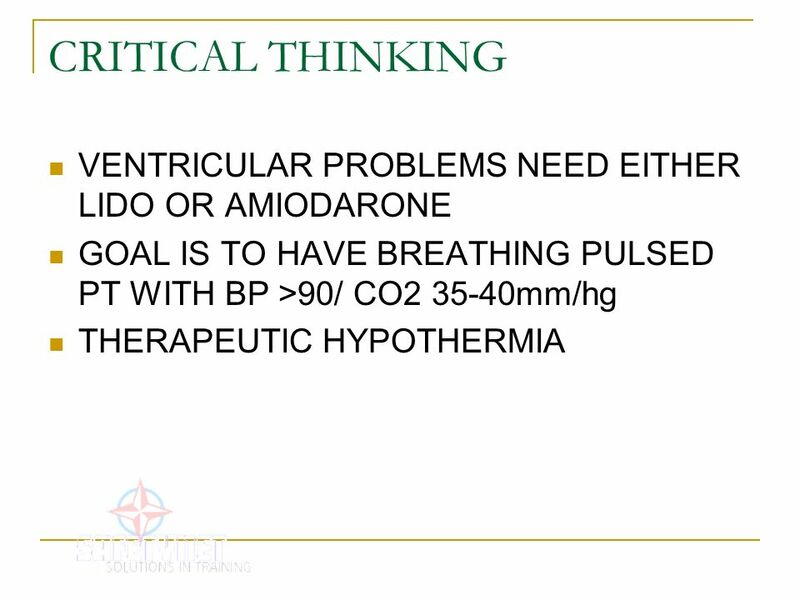 Holding your breath and bearing down (Valsalva maneuver). Immersing your face in ice-cold water (diving reflex). Coughing. 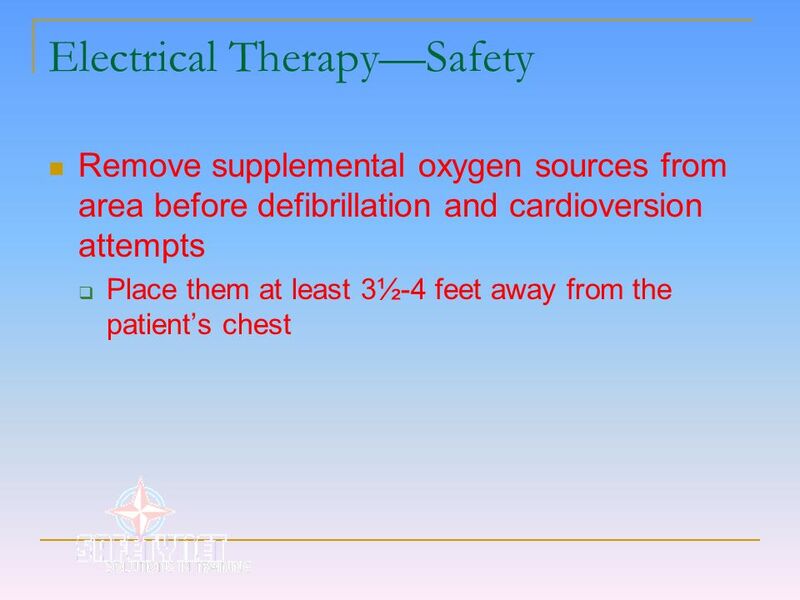 Remove supplemental oxygen sources from area before defibrillation and cardioversion attempts Place them at least 3½-4 feet away from the patient’s chest Remove supplemental oxygen sources from the area of the patient’s bed before defibrillation and cardioversion attempts and place them at least 3 1/2 to 4 feet away from the patient’s chest. 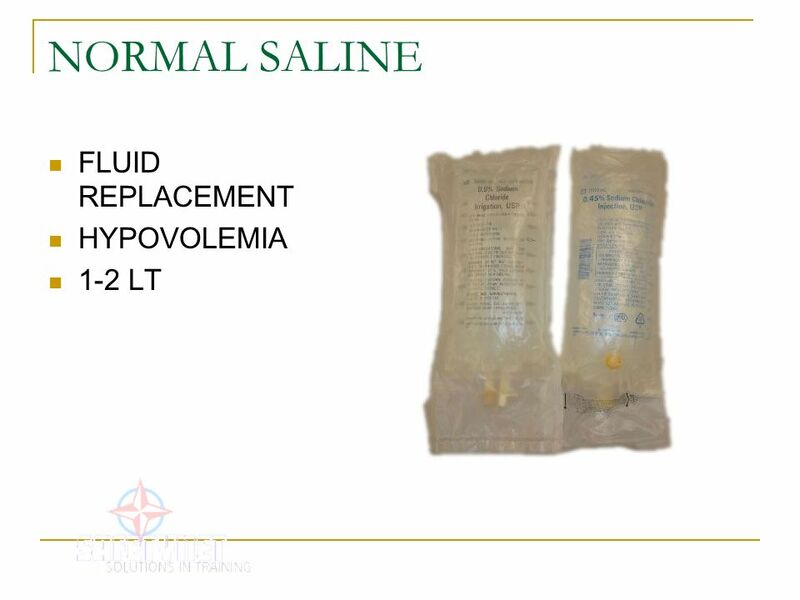 Examples of supplemental oxygen sources include masks, nasal cannulae, resuscitation bags, and ventilator tubing. Case reports exist that describe instances of fires ignited by sparks from poorly applied defibrillator paddles/pads in the presence of an oxygen-enriched atmosphere (Theodorou 2003). Severe fires have resulted when ventilator tubing was disconnected from an endotracheal tube and then left next to the patient’s head while defibrillation was attempted. Set initial rate at 100 pulses/min. 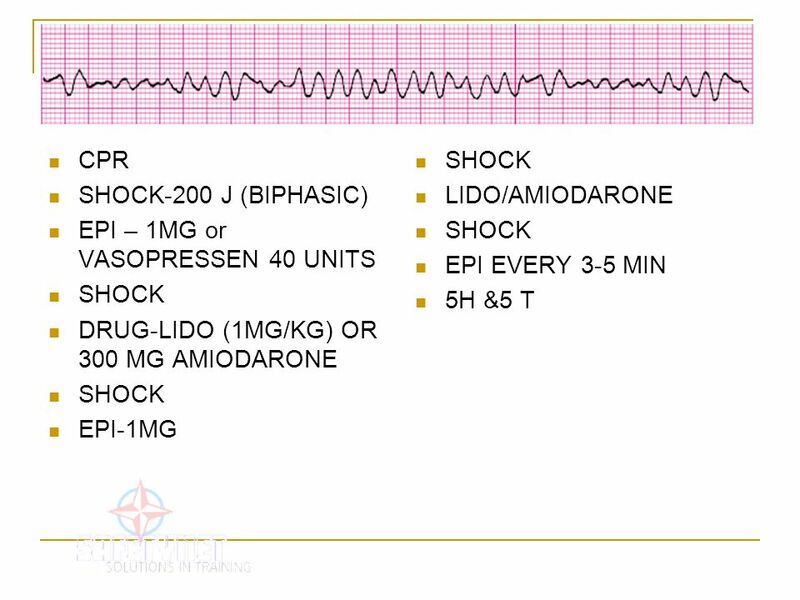 Increase the output (mA) until pacer spikes are visible before each QRS complex. Verify capture. The final mA setting should be slightly above where capture is obtained to help prevent the loss of capture. 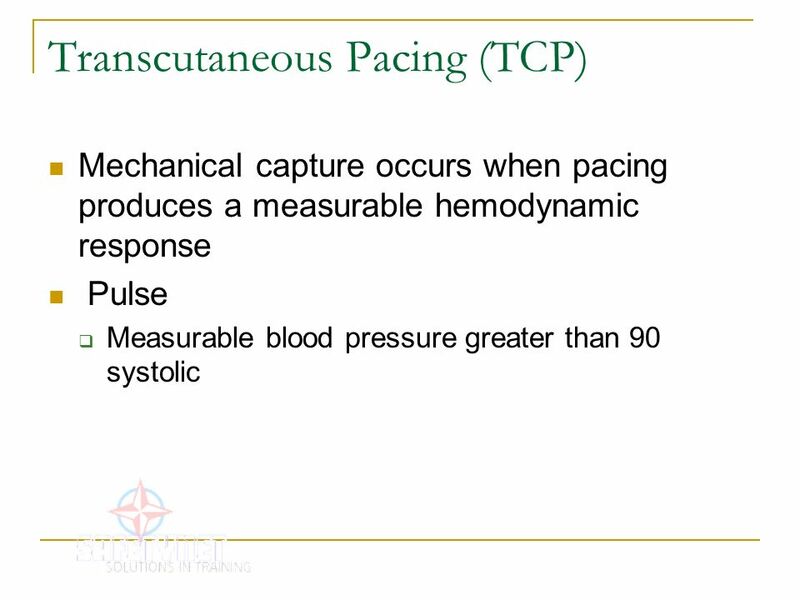 Mechanical capture occurs when pacing produces a measurable hemodynamic response Pulse Measurable blood pressure greater than 90 systolic Assess mechanical capture by checking the patient’s right upper extremity or femoral pulses. 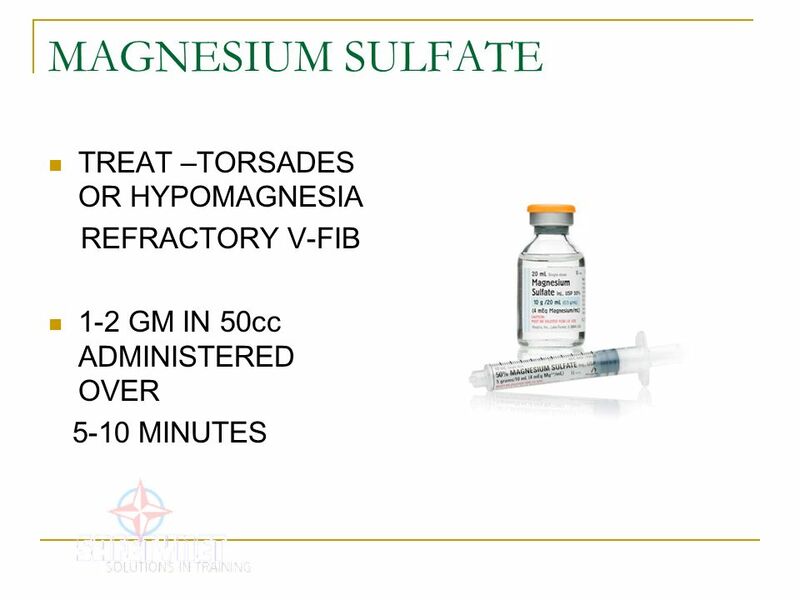 Avoid assessment of pulses in the patient’s neck or on the patient’s left side. 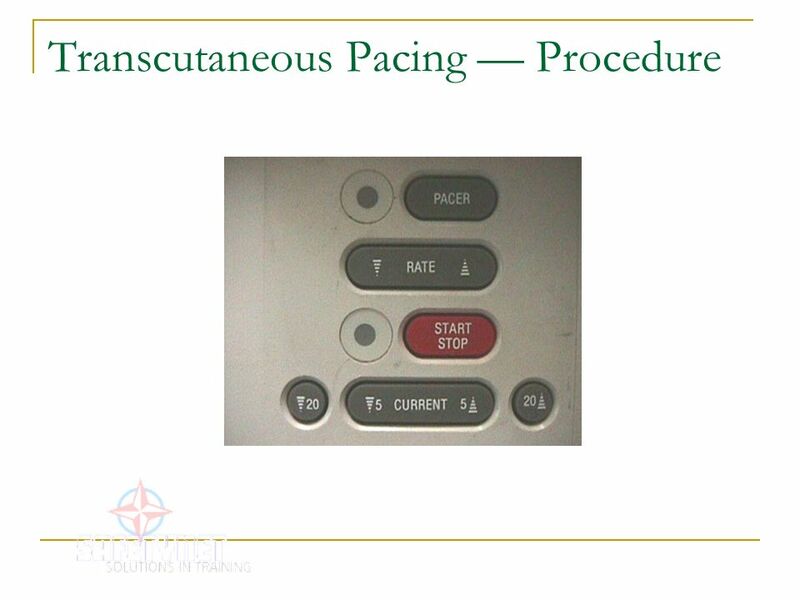 This helps minimize confusion between the presence of an actual pulse and skeletal muscle contractions caused by the pacemaker. Once capture is achieved, continue pacing at an output level slightly higher (about 2 mA) than the threshold of initial electrical capture. For example, if capture is achieved at 90 mA, set the output level at 92 mA. 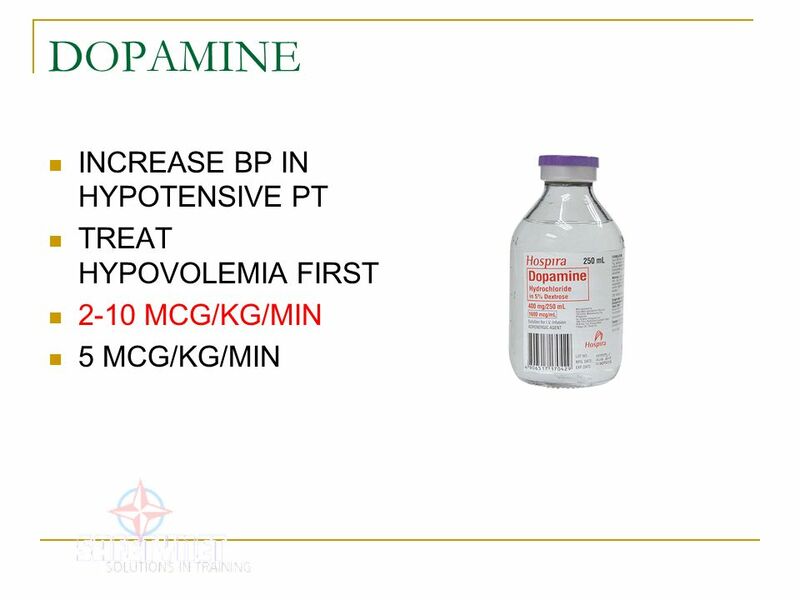 Assess the patient’s BP and level of responsiveness. 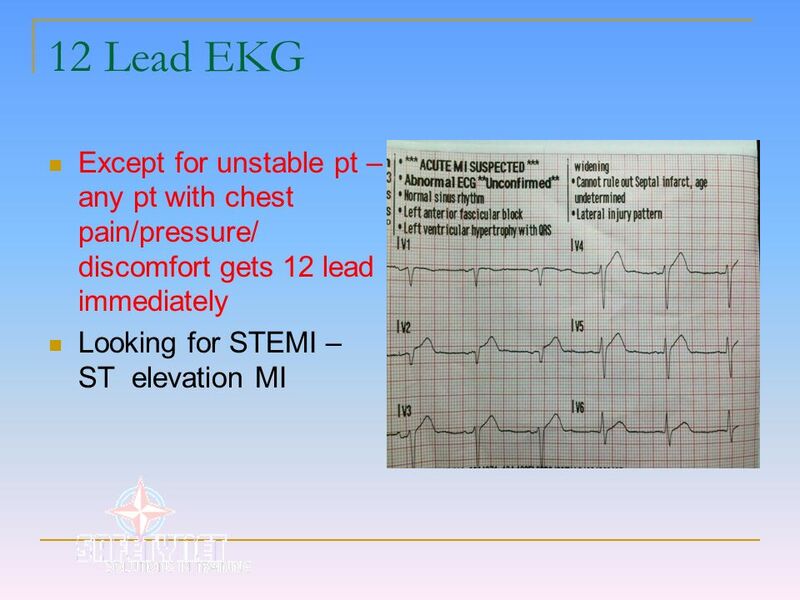 Monitor the patient closely and record the ECG rhythm. 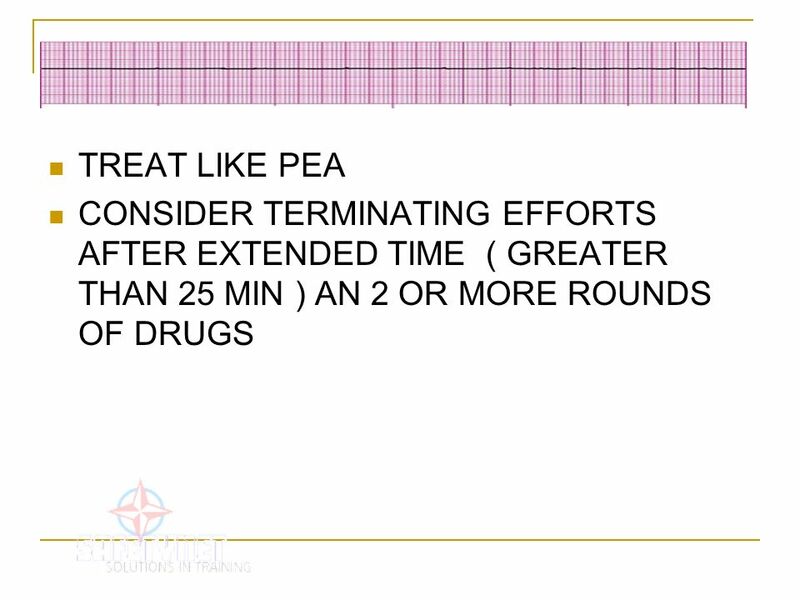 89 PEA-NO PULSE BUT SHOULD BE ONE ! 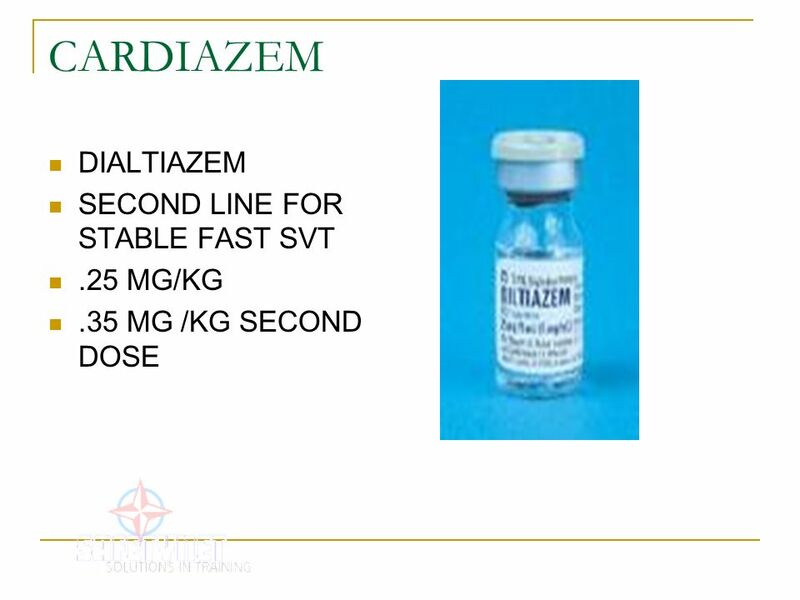 Cardiac Arrhythmia. 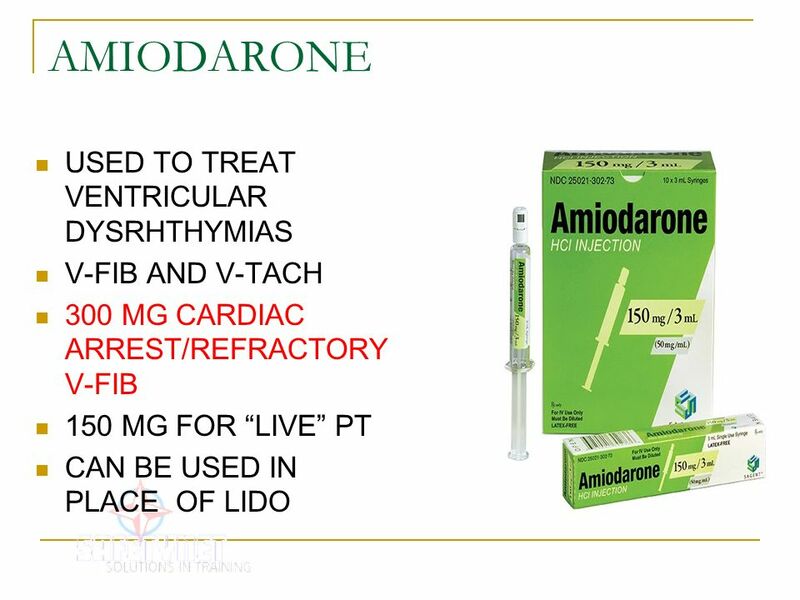 Cardiac Arrhythmia Definition: The pumping action of the heart is coordinated by an electrical system within the heart tissue. 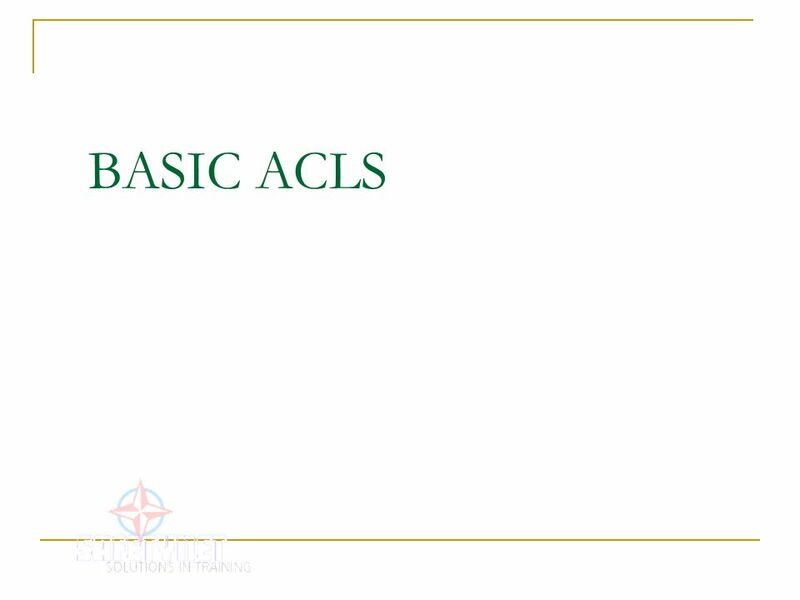 Presence Regional EMS February 2014 BLS CE. 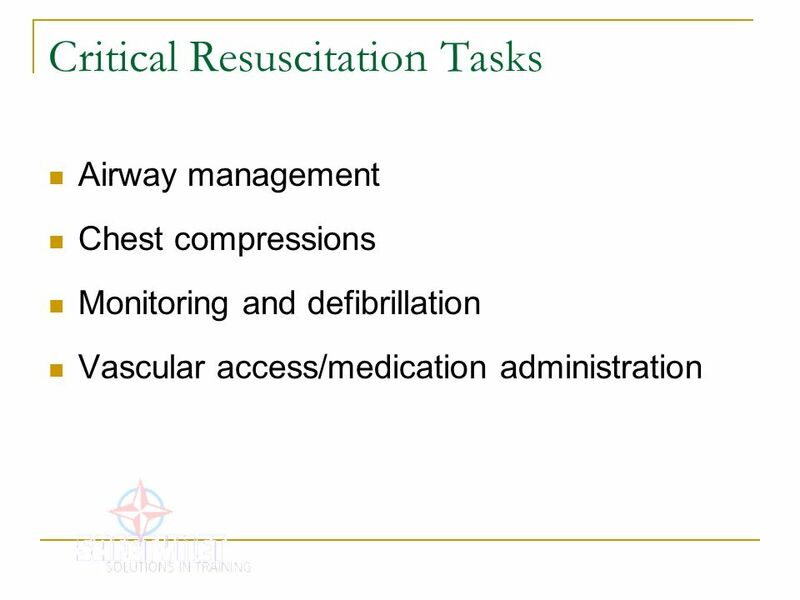  Review the steps to performing quality CPR. 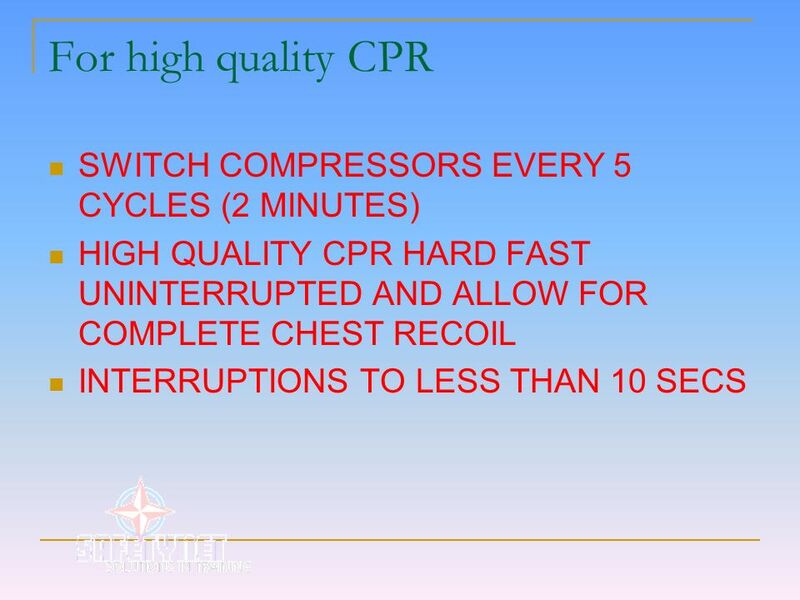  Demonstrate techniques of quality CPR.  Using a variety of. 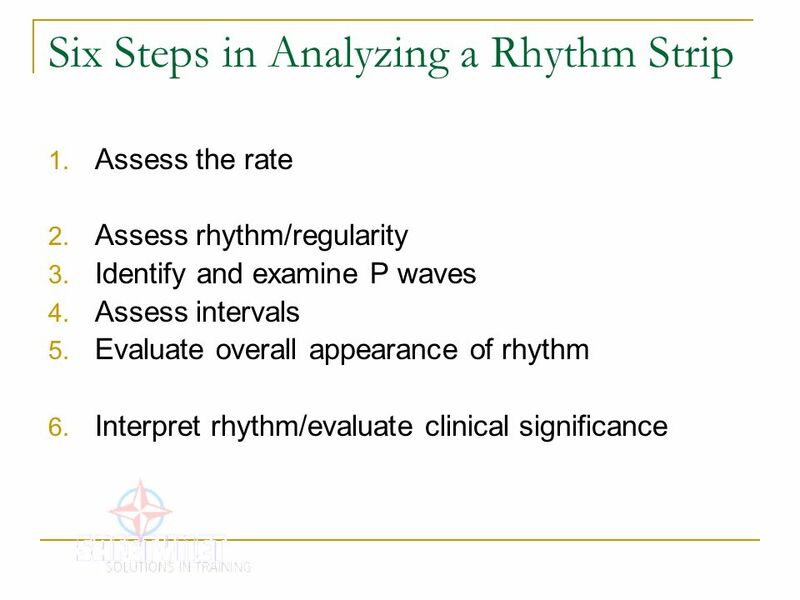 Ventricular Arrhythmias Terry White, RN, EMT-P. Analyze the Rhythm.